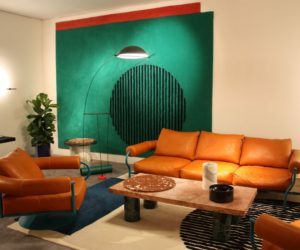 The Salon Art + Design 2015 was the fourth edition of the high-end fair and it did not disappoint, with gorgeous retro furnishings and stunning new modern decor pieces. At either end of the spectrum, the show offered art for life. 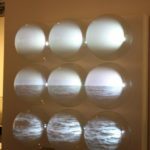 The focal point of the booth was Niamh Berry’s light sculpture, “Walking.” The Irish artist creates fine light sculptures and furniture, from a variety of materials. 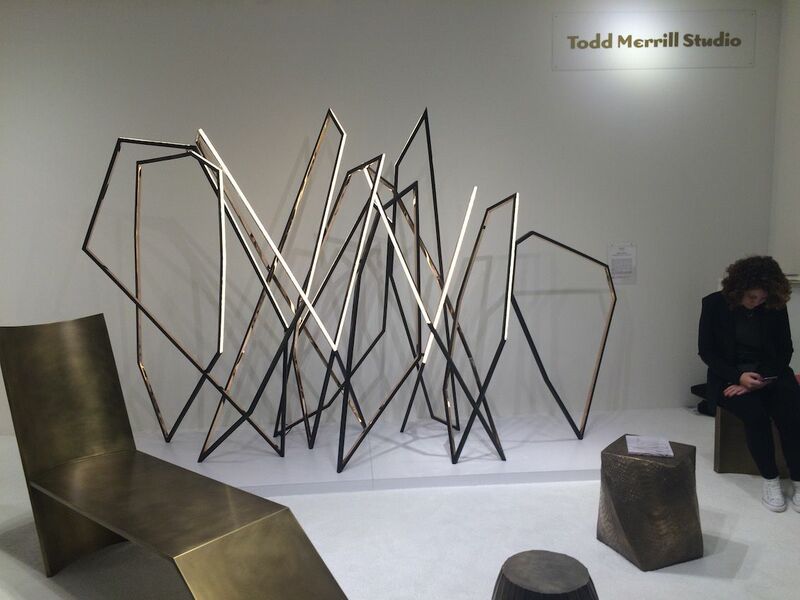 The Todd Merrill Studio presented a number of pieces that are not only unique in appearance but in also in artistic process. 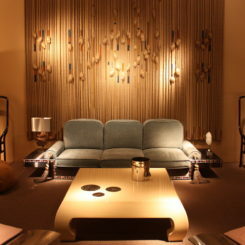 Whether as a visual addition to the home or as a functional piece, they were all very appealing. 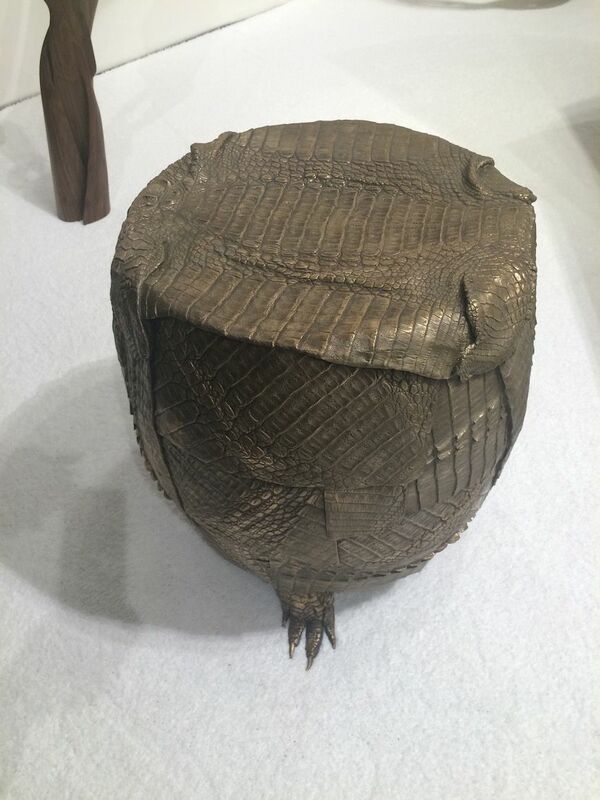 Erin Sullivan’s alligator piece is cast in bronze. Either as a stool or a small table, Erin Sullivan’s sculptural furniture features realistic features of organic subjects. 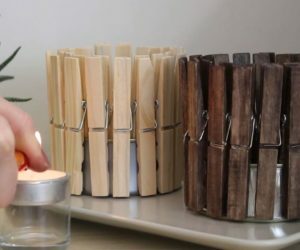 She uses the lost wax method, often used by jewelers, to create her striking pieces. This sculptural console by Fish is called Laminar and uses almost 400 pieces of American Black Walnut veneer. It is said to be inspired by marine life, although some people also see the image of a crawling man when they look at it. 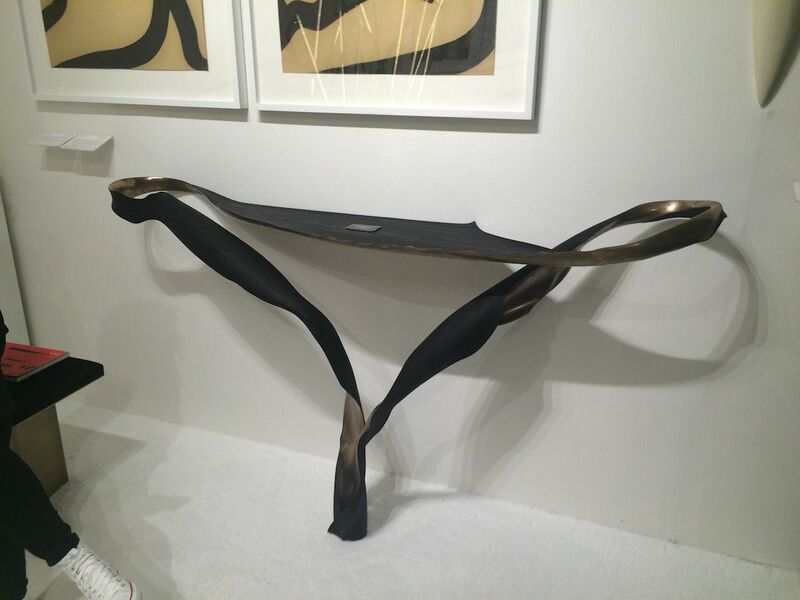 Fish’s Untitled Bronze 2 “One Piece” Console uses the wood, resin, bronze, and squid ink dye to texturize and enhance the piece. Another artist featured in the show by the Merrill Studio is Marc Fish. 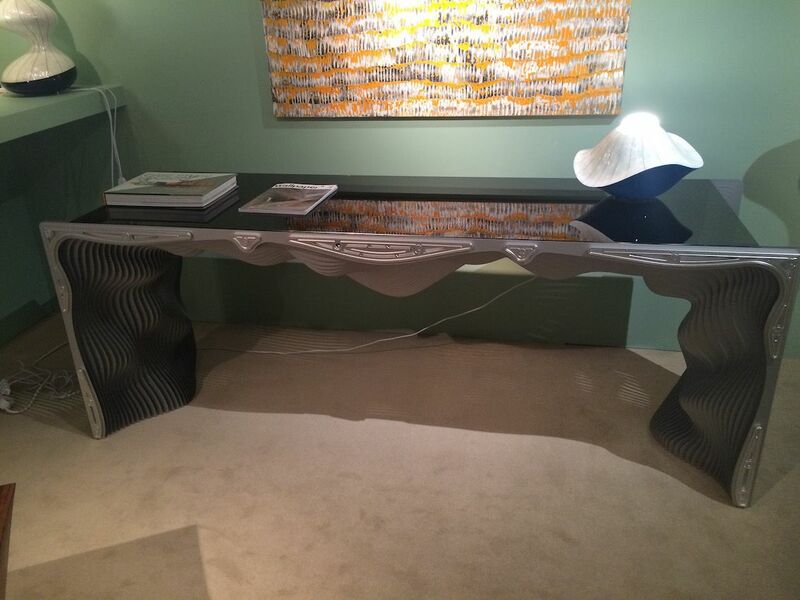 The UK artist and furniture maker created these console pieces. From a distance they appeared to be made of a metal, but on closer inspection, they look like carved wood with an amazing grain. In fact, they are made through micro-stock lamination and cold carved. The appearance of the grain comes from the nearly 100 wood layers that, manipulated into shape, hand-carved, and then sanded until smooth. 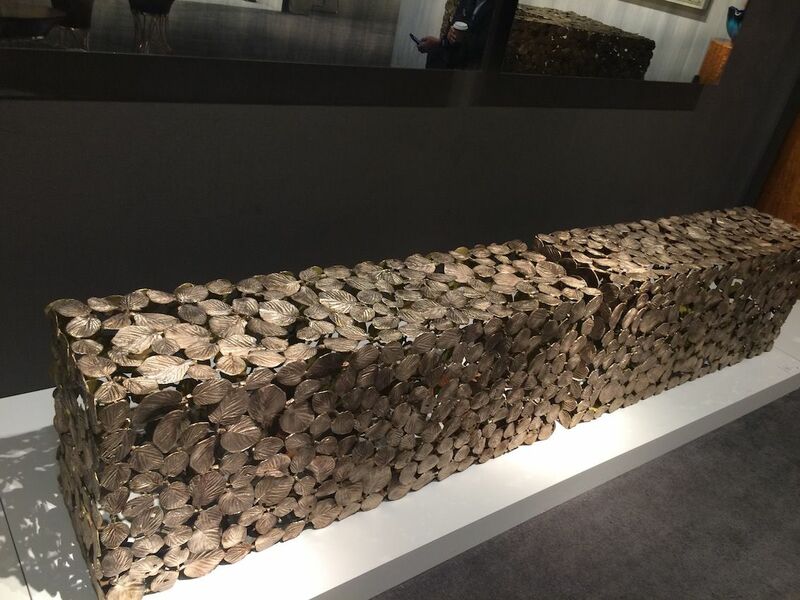 Berthelot’s bench, “Souvenirs Maritimes”, 2015, is an example of how his work focuses on merging function and beauty. 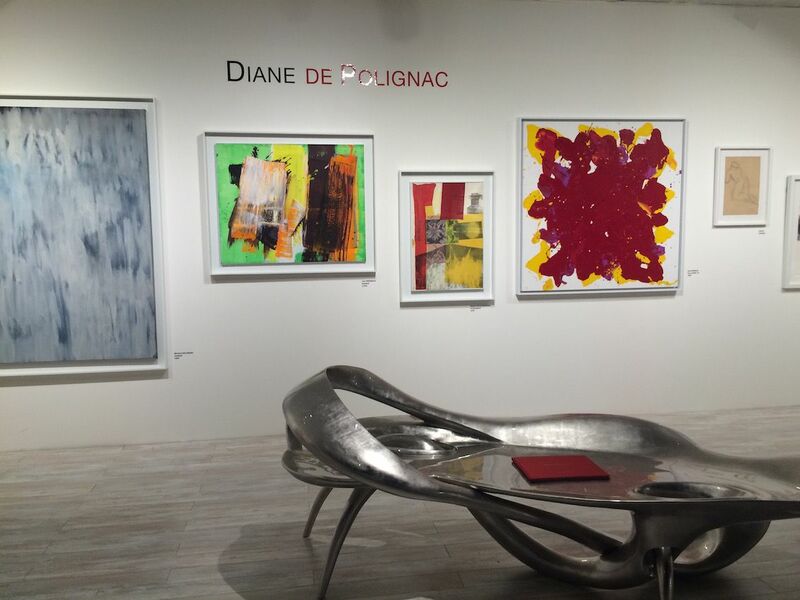 Parisian Gallery Diane de Polignac presented some lounge chairs and a bench from Quebec-based artist Gildas Berthelot. 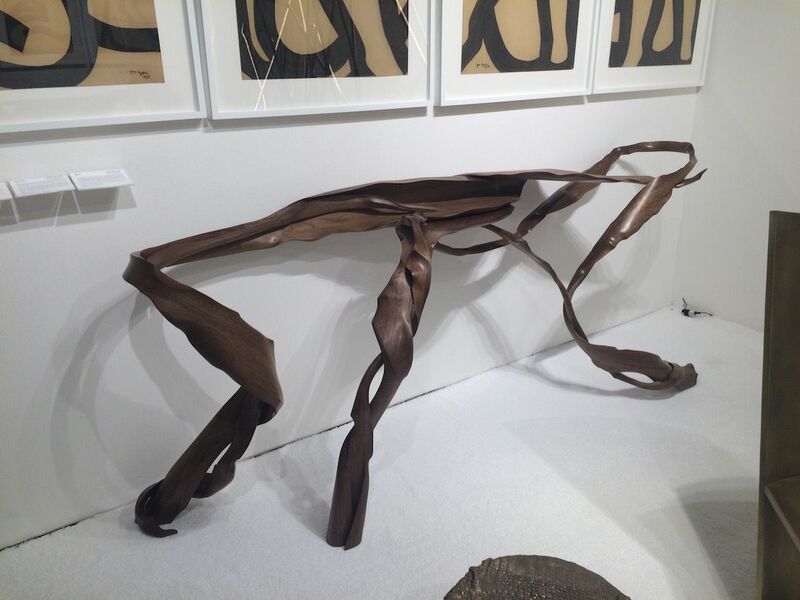 For us, the sinuous lines of the furniture are a perfect counterpoint to the abstract art. 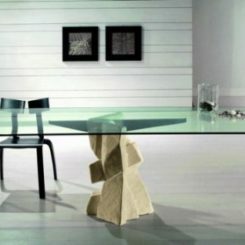 The undulating cubes and pointed legs contribute to a feeling of water and perhaps sea creatures. La Nonchalante, 2015 by Berthelot. The pale wood and curves of the lounge give the impression that the piece is a living organism. 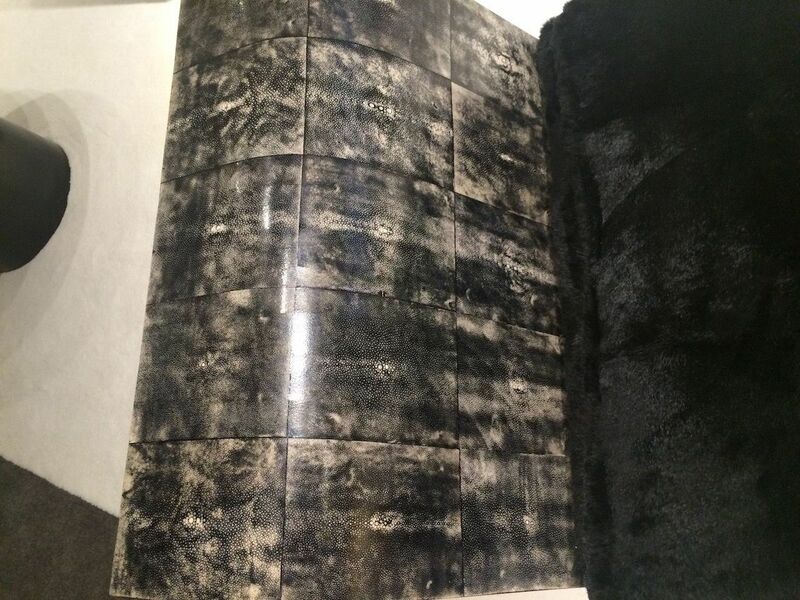 The skins of the Pirarucu — also called an arapaima — are applied to the seating by French artisans. 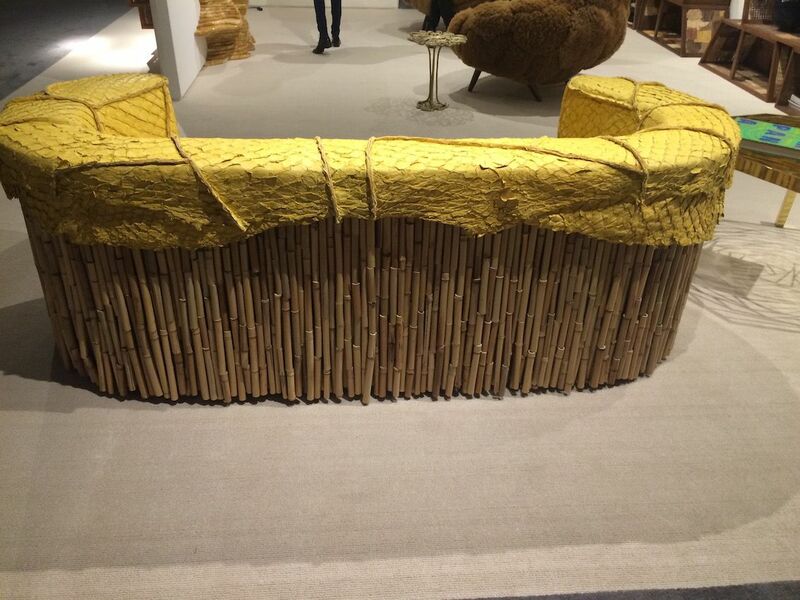 The back of the sofa is made of vertically assembled bamboo, which contributes to the organic look. 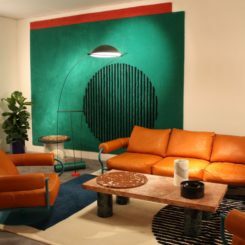 Friedman Benda presented an entire living room of pieces from Humberto and Fernando Campana, who are famed Brazilian designers. 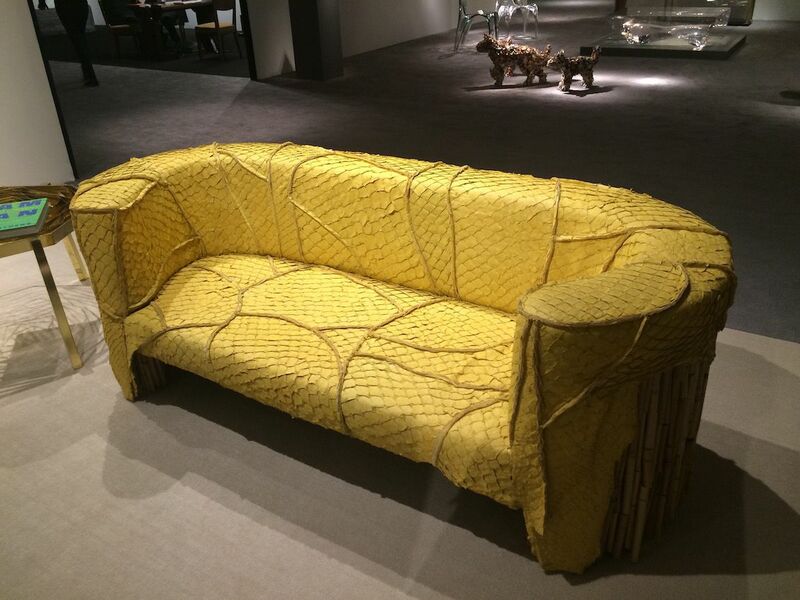 This Pirarucu Sofa, 2014 is made from the tanned skins of the Pirarucu, which is one of the world’s largest fresh-water fish in the amazon. 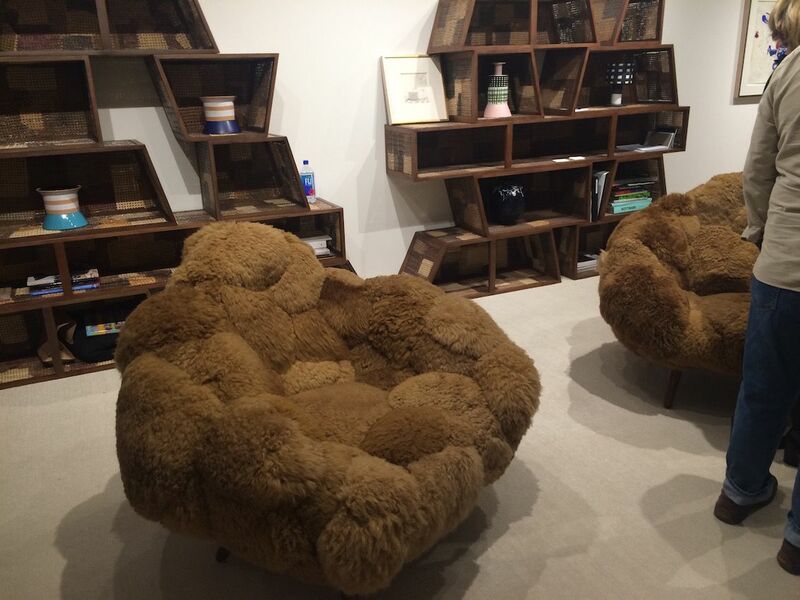 So soft and fluffy, you can’t help but want to sink into these chairs. 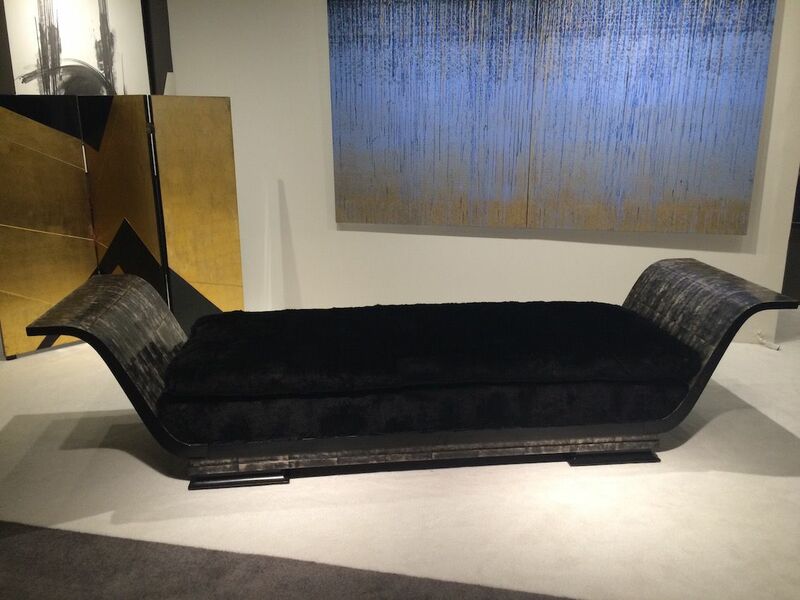 The Campana brothers have also created a bolotas sofa in purple that is especially modern. 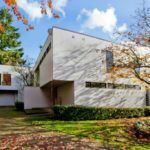 has particular visual interest thanks to its unique angles and textures. 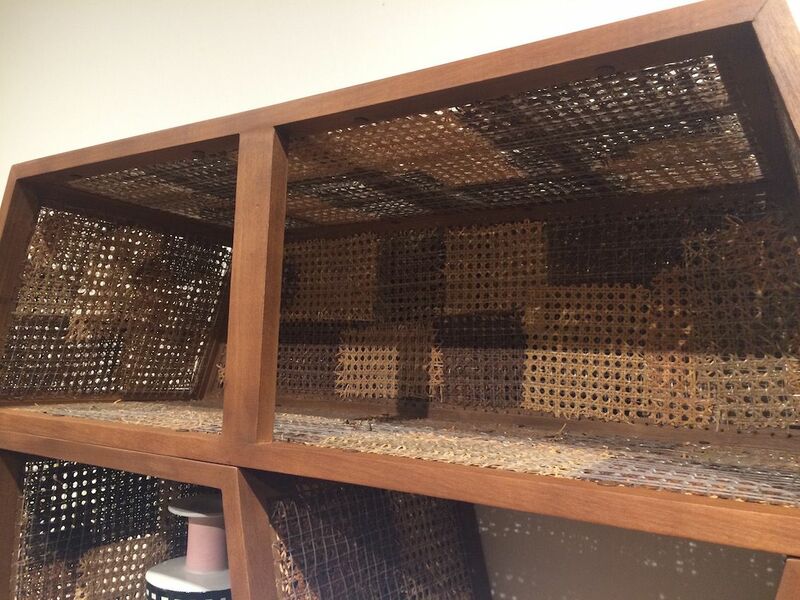 The “detonato” has a freijó wood structure with transparent nylon weave and a patchwork of reclaimed thong wicker. 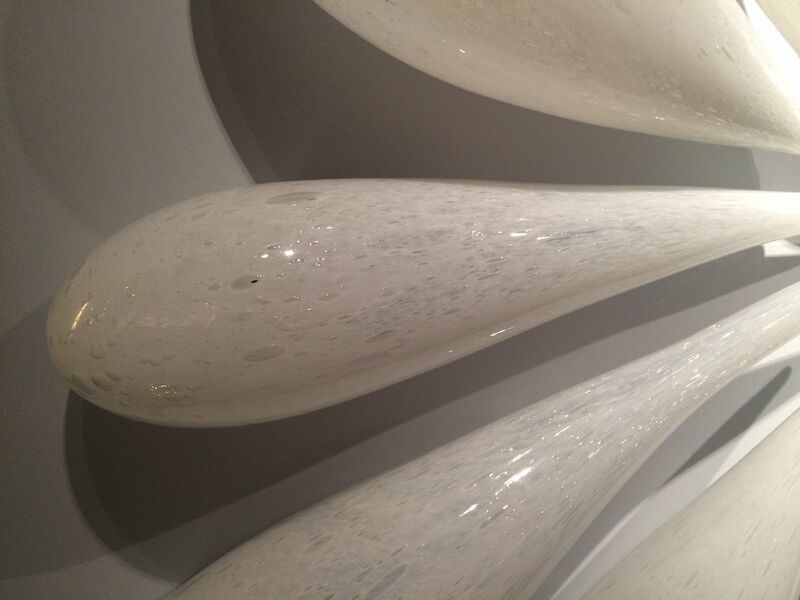 All smooth curves, yet far from orderly, this marble piece is certainly one of a kind. 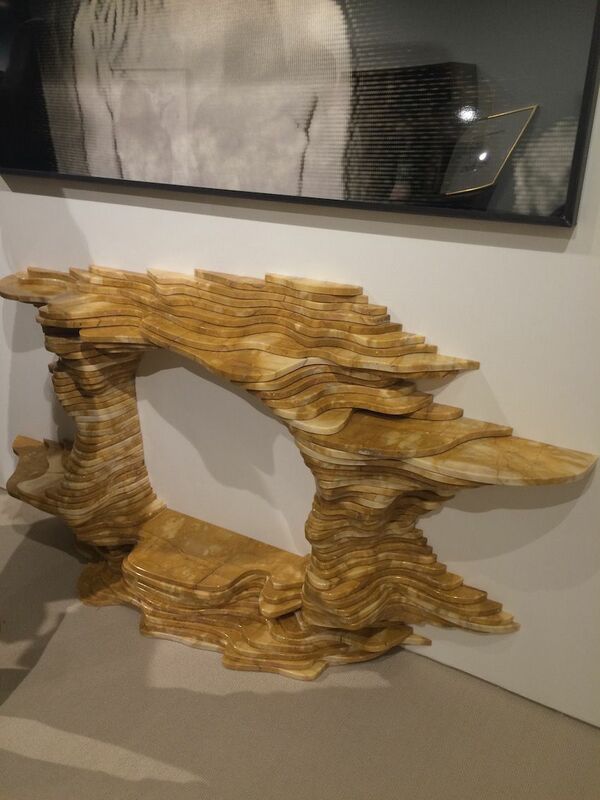 This marble console in the Friedman Benda booth was a stunner. The artfully stacked layers of stone, each separately carved, make for a real statement piece. 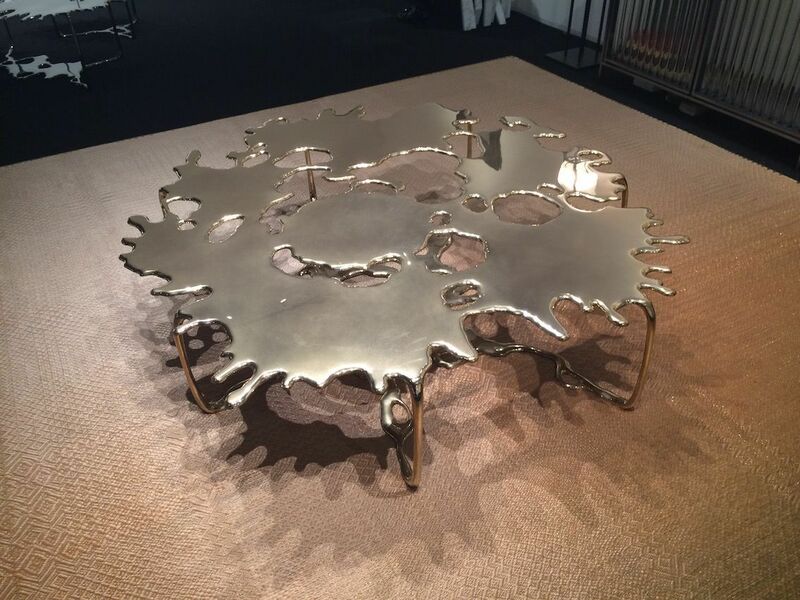 The Campana’s Fitas Table, made of bent brass. 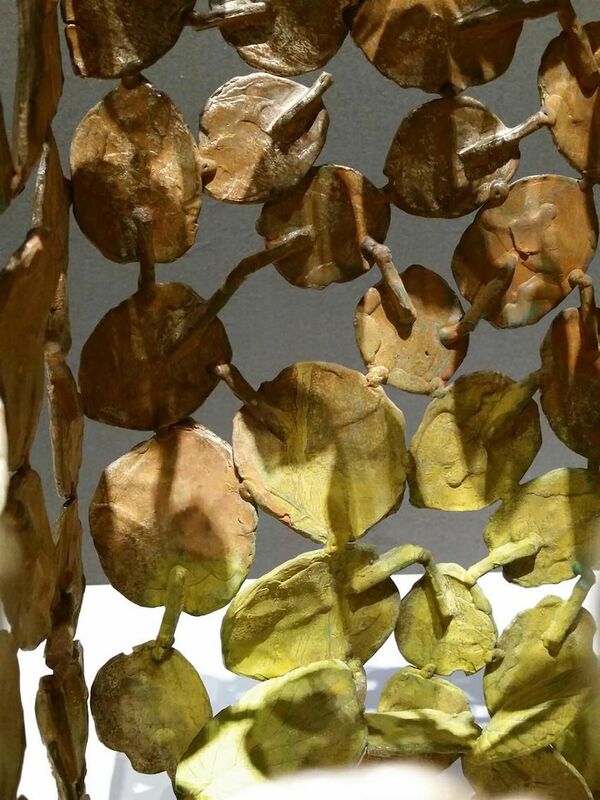 Here the artist uses even damaged leaves for the casting, which only enhances the organic nature of the piece. 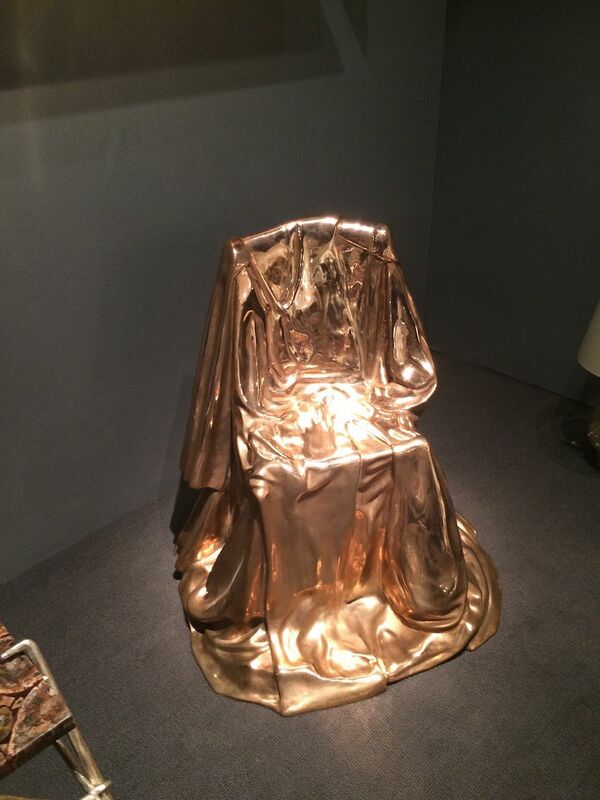 We were particularly taken by these bronze seats by Gregory Nangle from the Wexler Gallery. Made of individually cast winter hazel leaves, the benches and an accompanying chair have many visual surprises. While from the exterior, the indoor/outdoor piece is all bronze, the inside presence a visual delight. 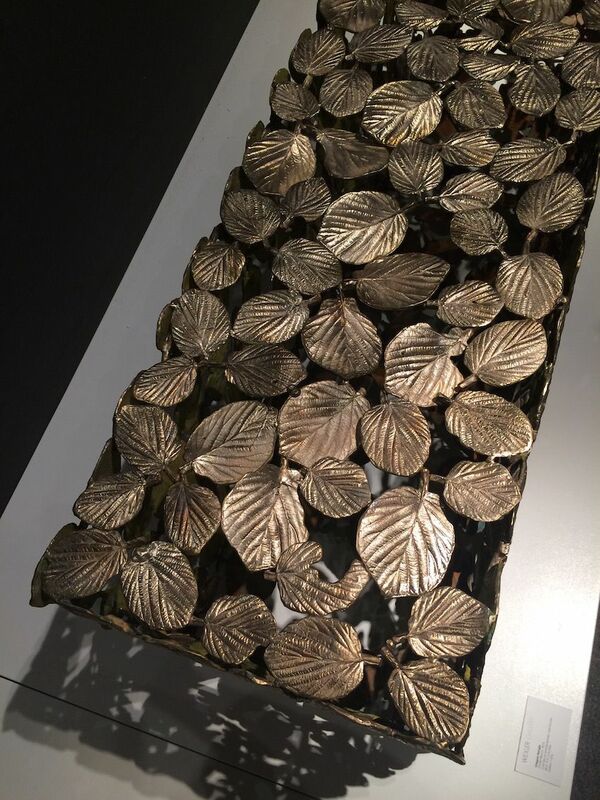 Each piece has a different color gradation, and with the varying light from different angles, reminds the viewer of dappled sunlight on the leaves. 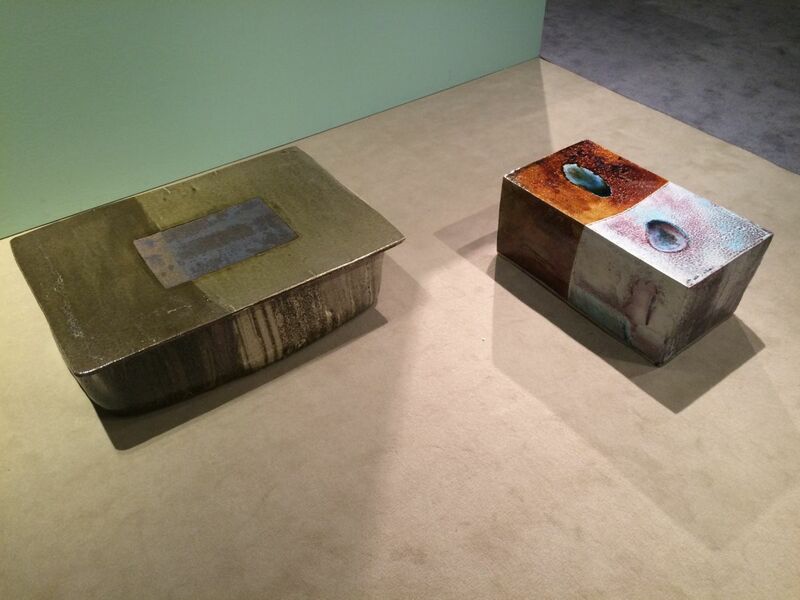 The gradation of the colored patina on the inside of Nangle’s works features various shades of green, yellow, orange and brown. Made of a special Japanese wood, the grain is the first thing you notice upon inspection. 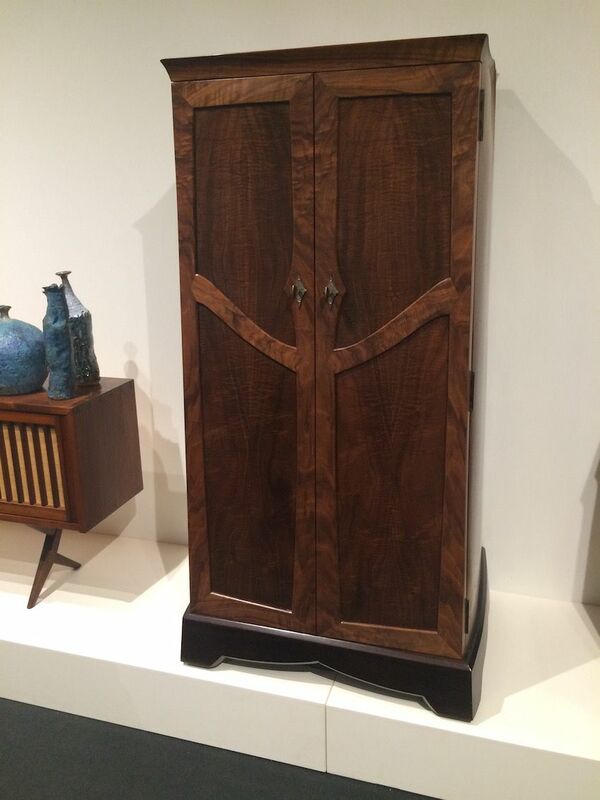 We were drawn to this small armoire because we love round wooden pieces. 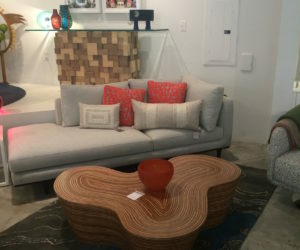 The skill required to manipulate flat, angular wood into a beautiful rounded furnishing is very special. Philadelphia artist Michael Hurwitz, who created this piece, is represented in several public collections including the Museum of Fine Arts, Boston, Massachusetts, and the Smithsonian Institution, Washington, DC. 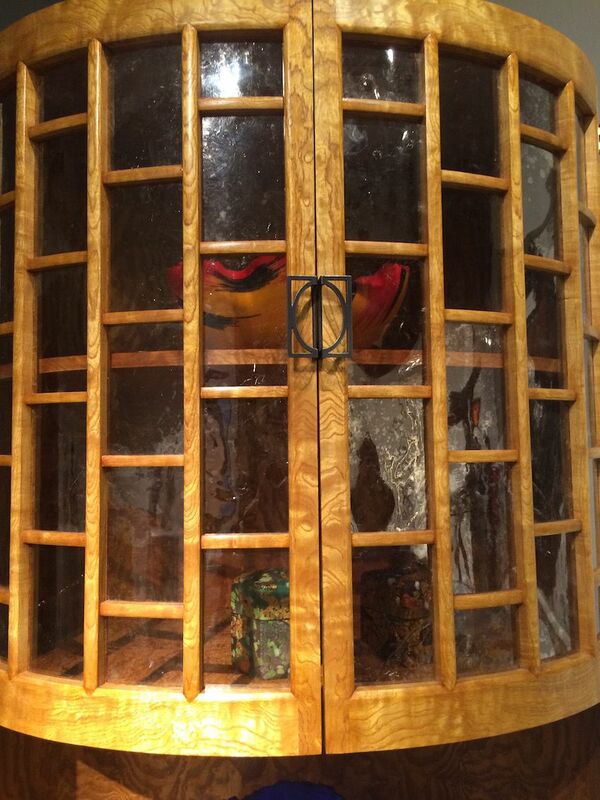 Instead of glass panes, Hurewitz uses mica to serve as windows into the display area of the armoire. 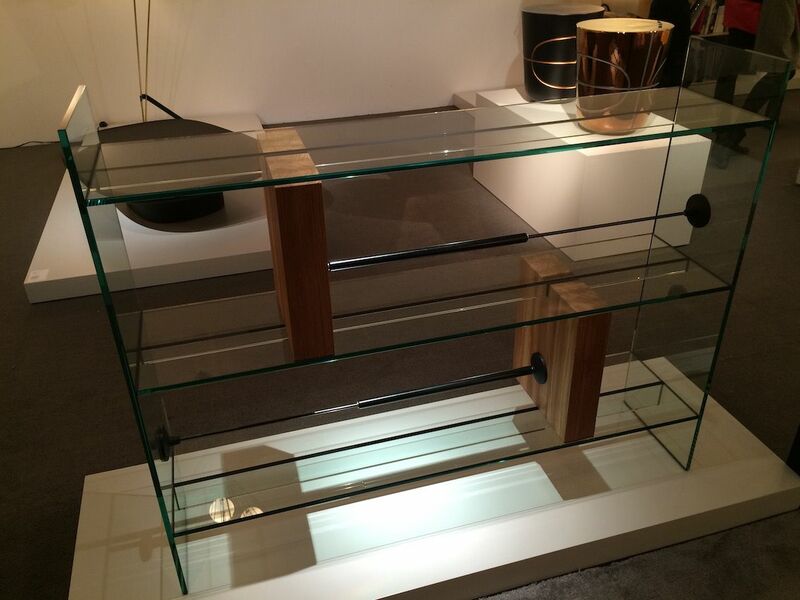 The display by Seomi International had a variety of modern decor pieces, both furnishings and accessories, that are artful and functional. 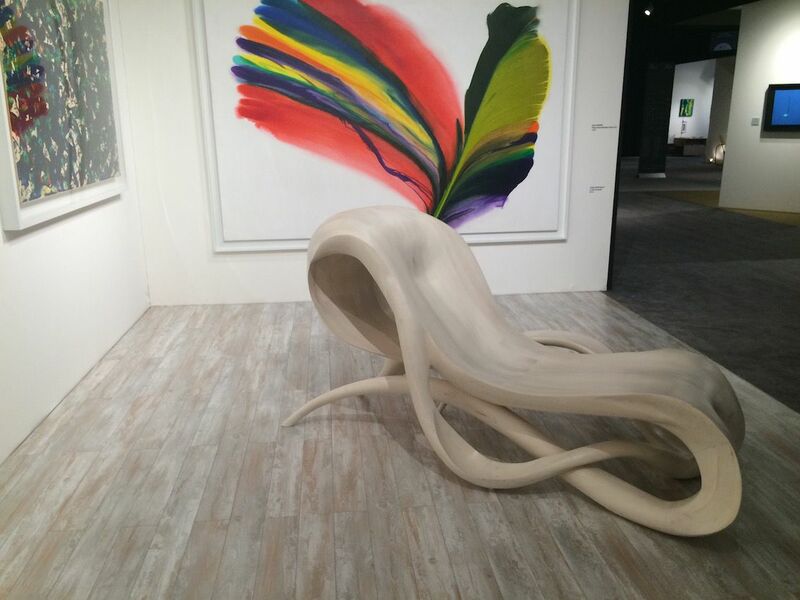 Artist Choi Byung Hoon created these very organic furnishings. Sculpted from black granite, the “Afterimage” outdoor stools are minimalist and eminently functional. 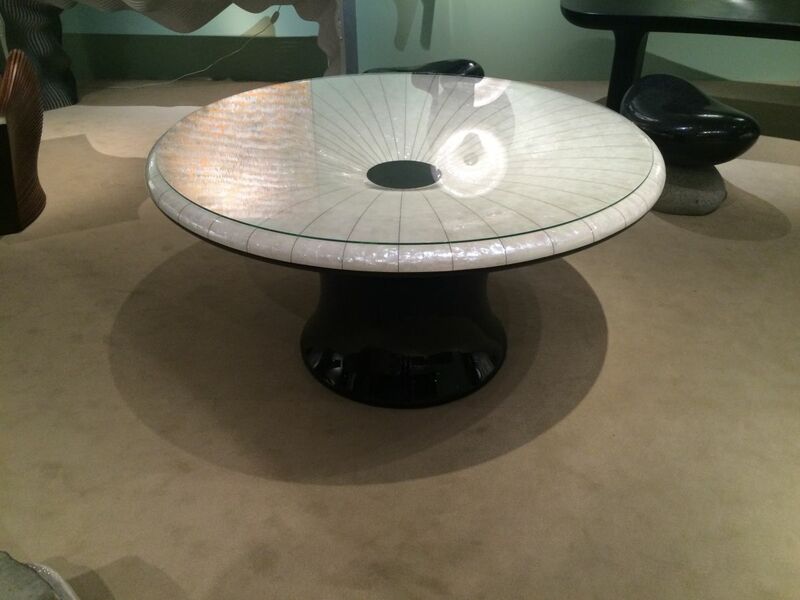 The table, which goes by the same name, is made from black lacquer on red oak, with natural stone. Pictured left is BADA-131210-04 and Brown & White Object (With Blue Dot) is on the left. 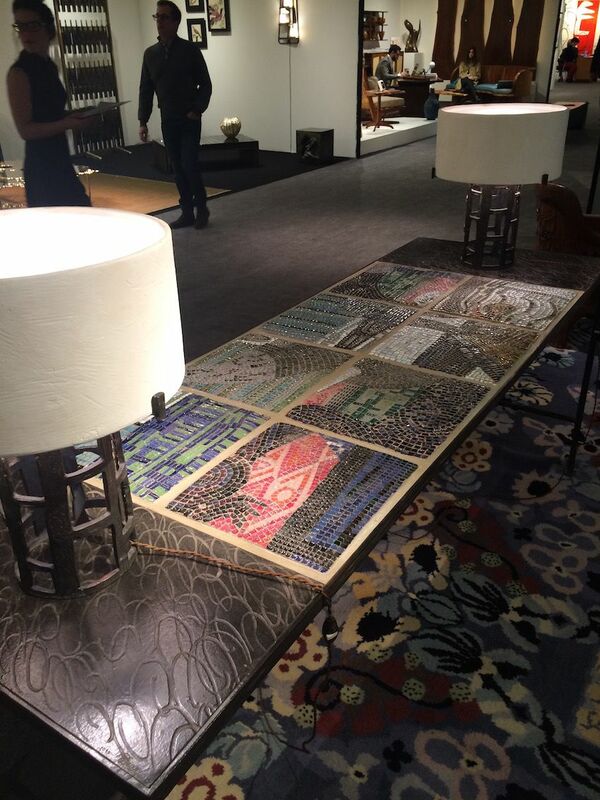 These glazed ceramic pieces can function as art objects or occasional tables. 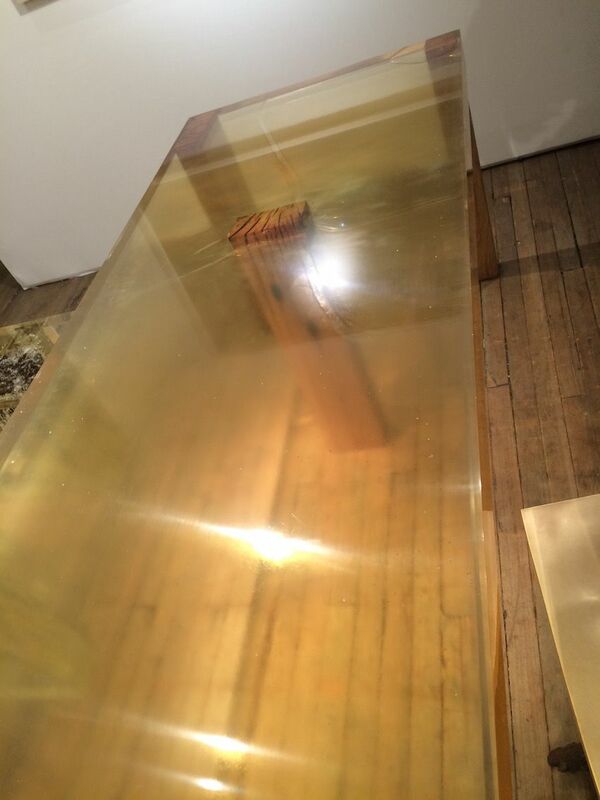 Her “From the Glitter” Table sloped inward toward the center and is topped with glass. Artist Kang Myung Sun is known for using the traditional craftsmanship used for lacquer work inlaid with mother-of-pearl in innovative ways. According to her statement, she seeks to show the natural aspects of her works. 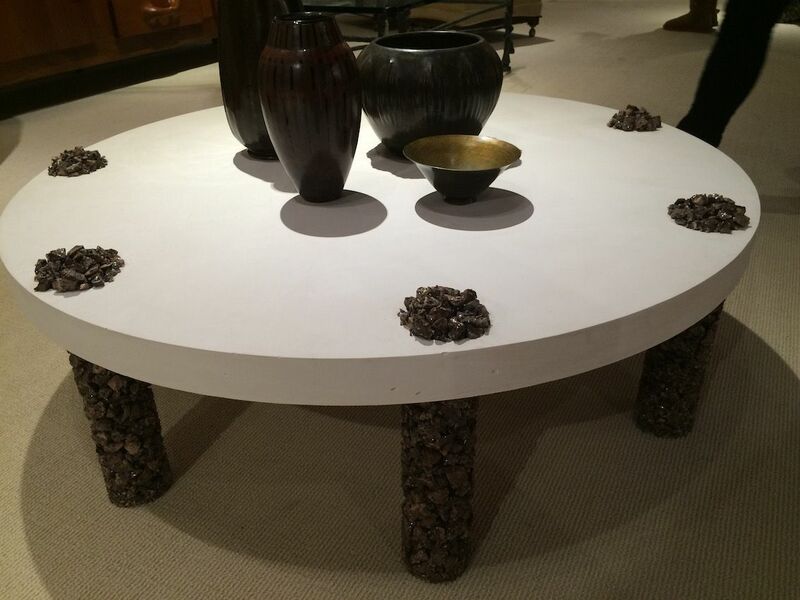 This table is Mother-of-pearl, Korean lacquer on wood layered with linen, red clay, and charcoal. The same series includes this wall piece that opens to reveal a black lacquered shelf. The inside is just as finely crafted as the outside. 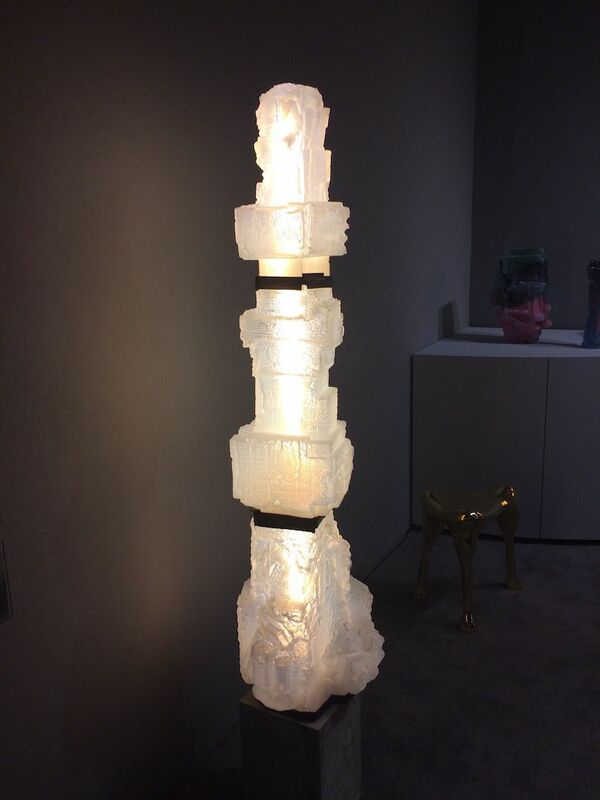 Her From the Glitter series also includes table lighting fixtures. 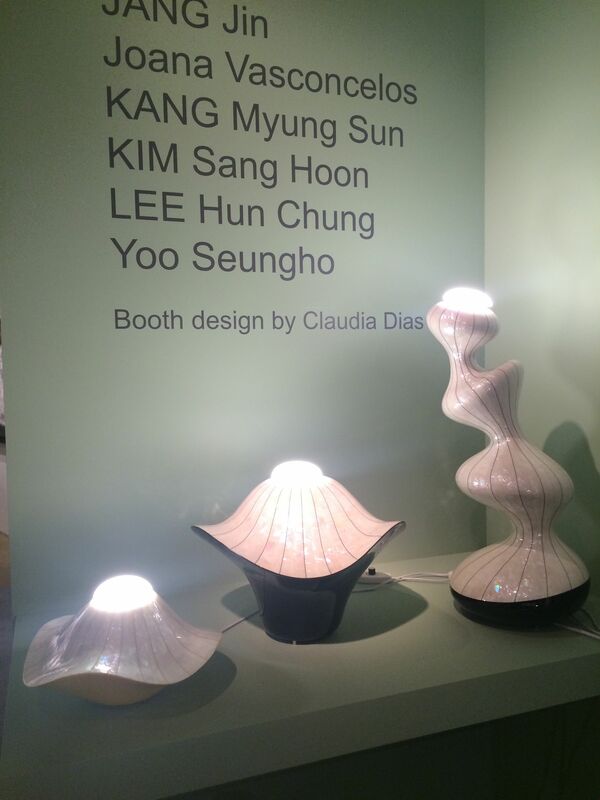 PHENOMENA 2015-0001 by Kim Sang Hoon is made of Luxteel, Aluminum, Wood and Glass. 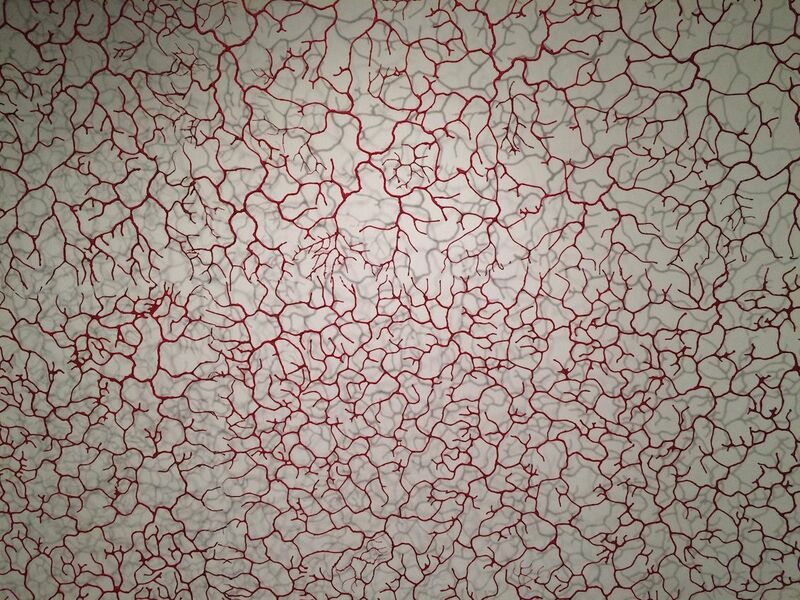 Artist Kim Song Hoon was “was barely out of school when his Phenomena screen became just that, a phenomenon. 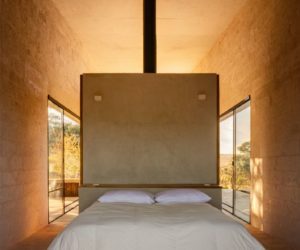 Made of undulating horizontal strips of wood, the room divider both separates and brings two spaces together’: according to his bio. Here. he has extended the concept to the unusual “Phenomena” console. 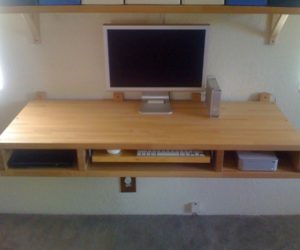 The undulating strips in the legs of his console bring interest to an often neglected area of this type of furniture piece. 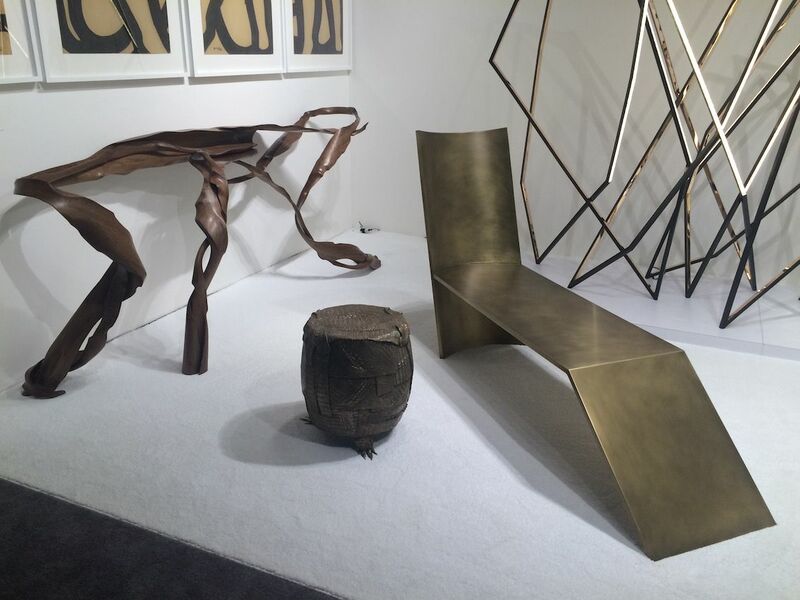 The Salon Art+ Design presented its share of home decor accessories and art pieces. 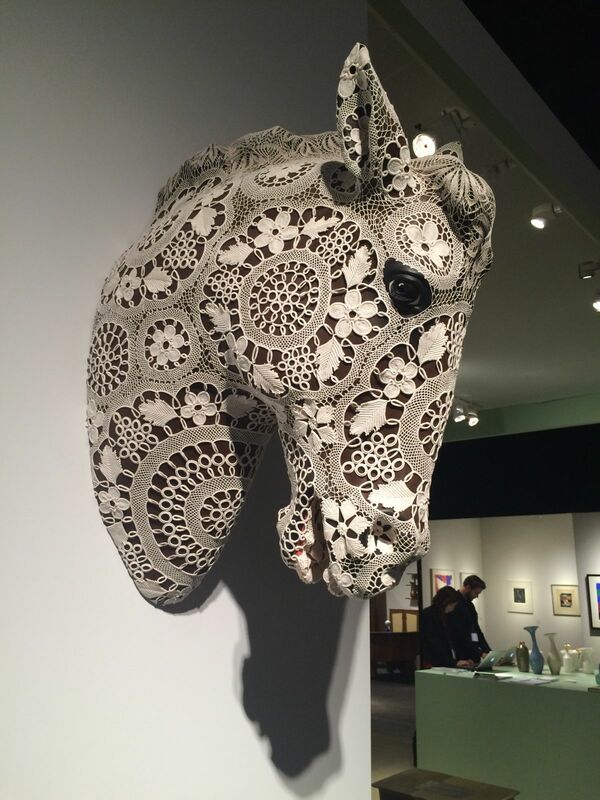 This work by Joana Vasconcelos is a ceramic horsehide covered with lace. 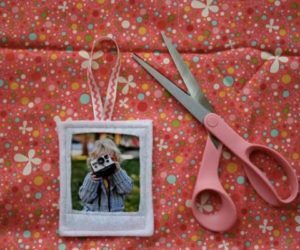 She takes everyday objects and materials and its them into new, complex works. 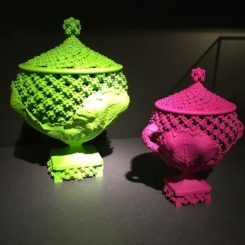 She “frequently incorporates crafts like knitting and crochet into her art, as well as common Portuguese household items like ceramic figures,” says her statement. 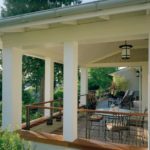 Adelmann’s Cherry Bomb wall lighting system is further highlighted with the metallic draping, which added interest to the brass tubing that creeps across the walls. 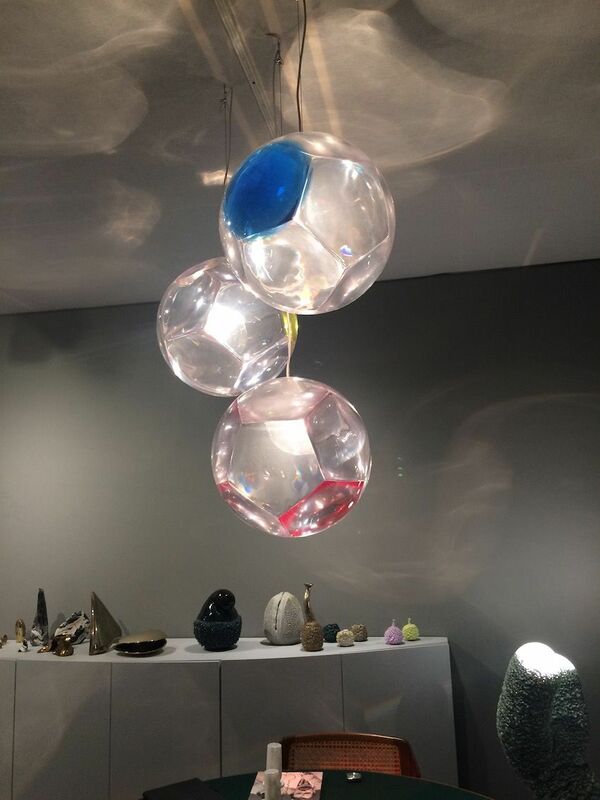 The Nilufar Gallery from Milan presented Lindsay Adelmann’s stunning Cherry Bomb lighting fixture. 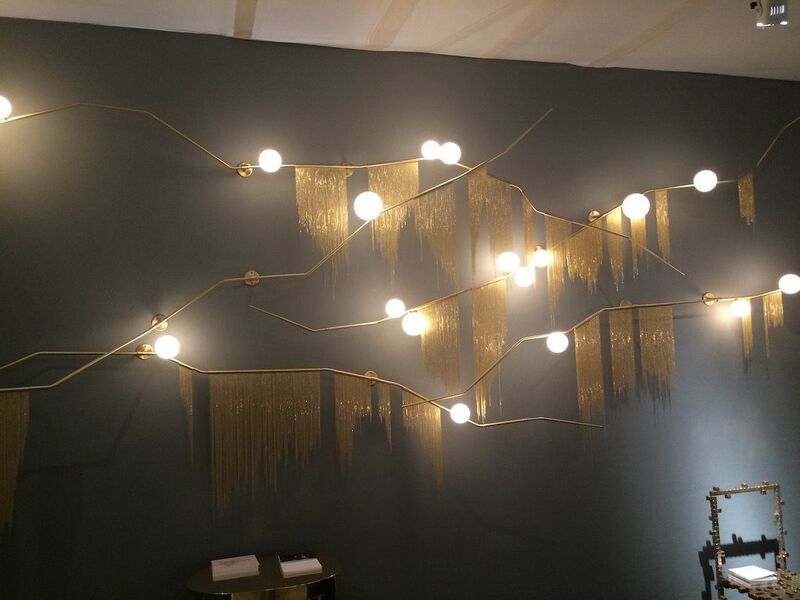 Homedit.com featured lighting from the Adelmann studio shortly after ICFF 2015. 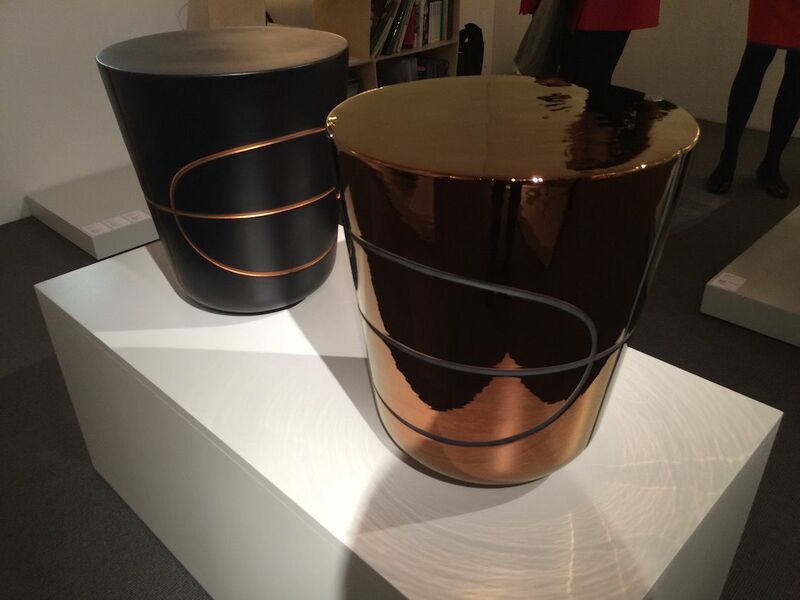 German’s Amman Gallery presented a range of pieces, but these from Studio Nucleo were most interesting! 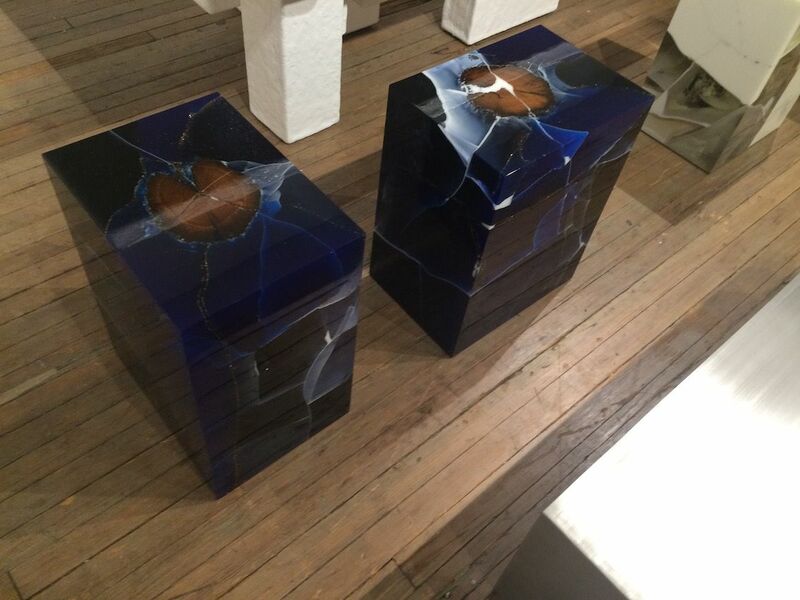 The Italian studio has developed a method to capture antique wooden pieces, such as these stools, inside resin. 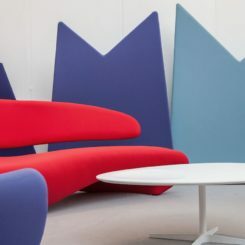 The resulting furniture is visually engaging and very useful. Based in Torino, Italy, Nucleo is a collective of artists and designers directed by Piergiorgio Robino. 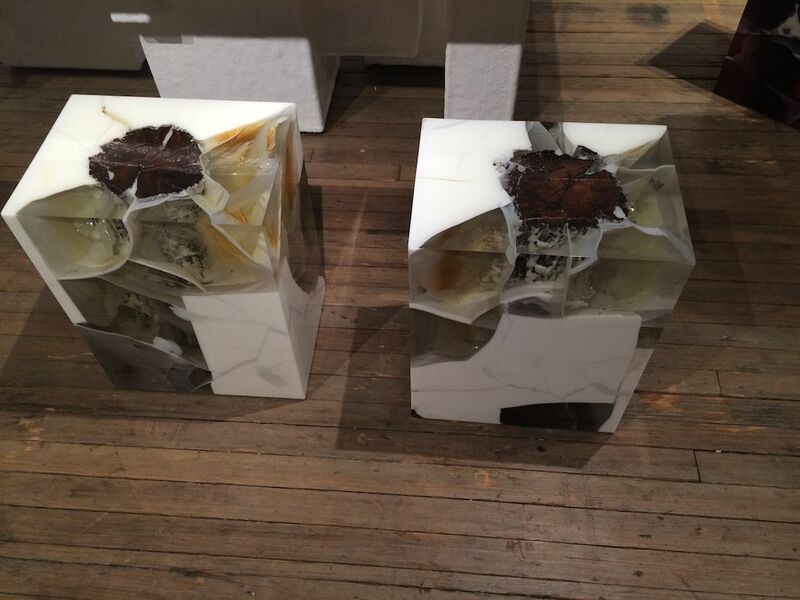 It is fascinating to see how Studio Nucleo can encase the separate parts in resin to maintain the bench shape. 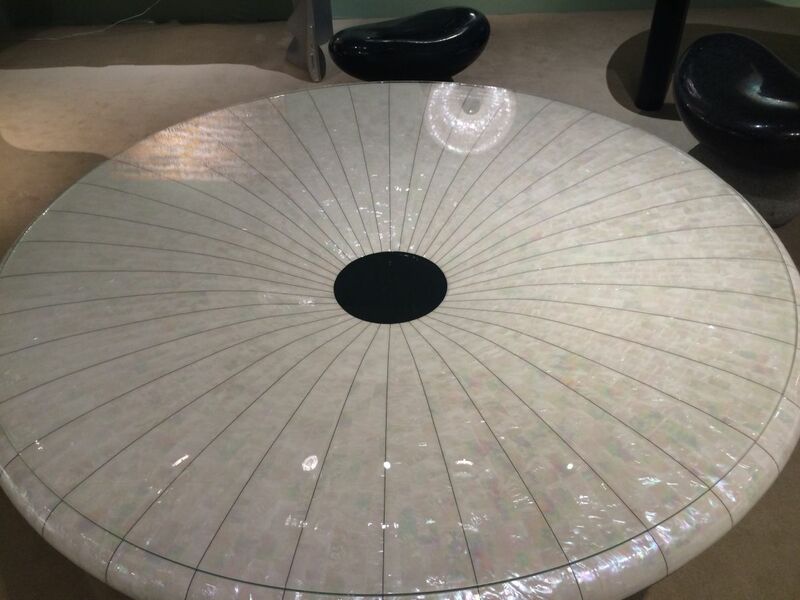 Inside the resin of the square bench, you can see one side of a round stool. 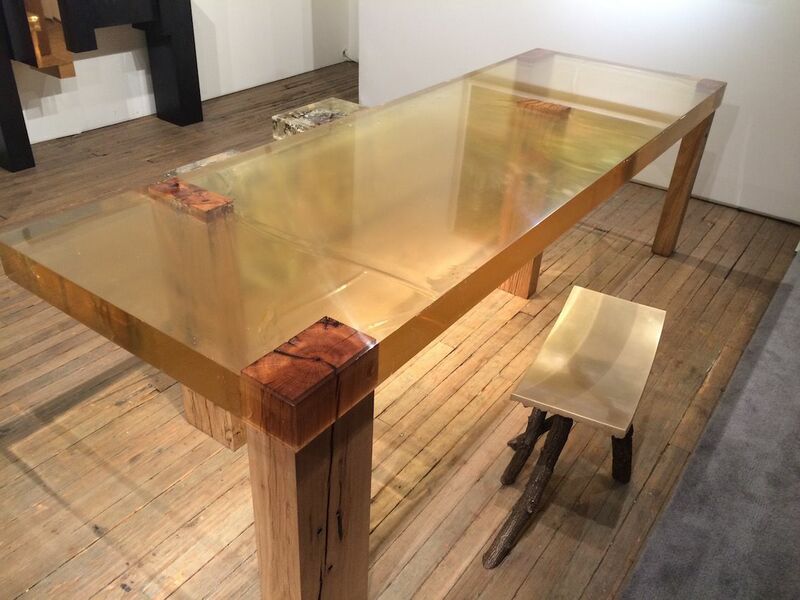 Wood Fossil Table 01, from 2013, highlights the wooden legs with a purely resin table top. Setting the legs into the resin magnifies the grain and imperfections of the wood, adding interest. Here the table is paired with Tree Study #03 – Impossible Tree, 2015, by Wolfs + Jung. 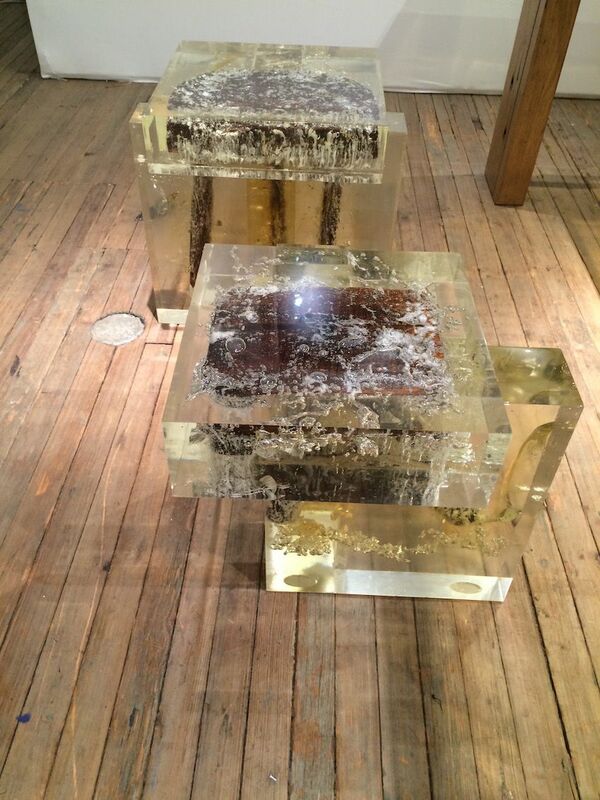 These amazing cubes, which are seating, tables and art all in one are also by Studio Nucleo. 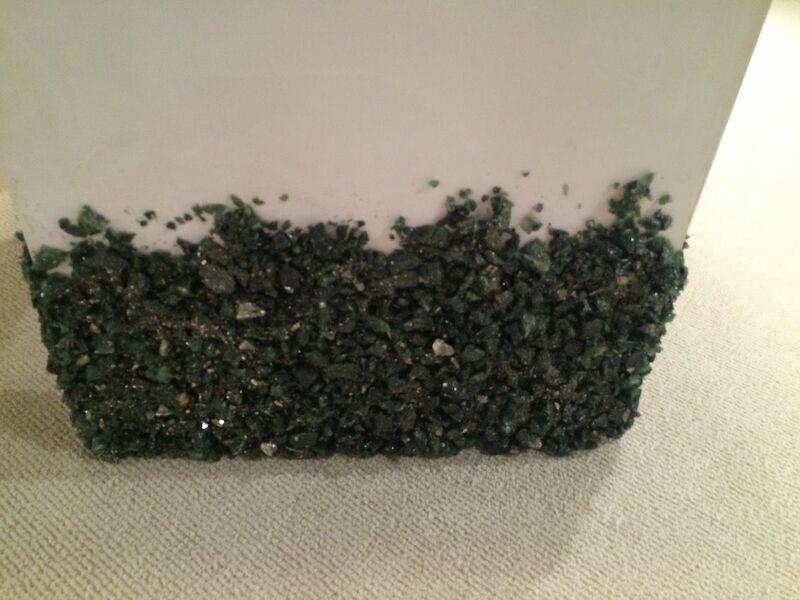 Again using epoxy resin the artisans create these “Stone Fossil” pieces with various pigments. 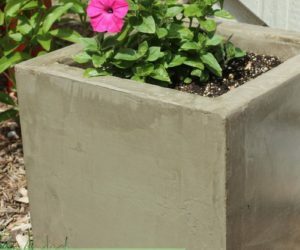 The pieces are available in different “stome” types and colors. This is Lapislazuli. Titled Gold Brick NO. 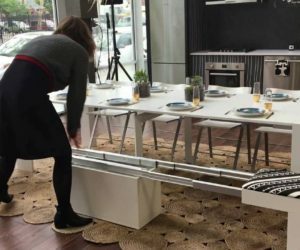 1, the table is made from stainless steel. 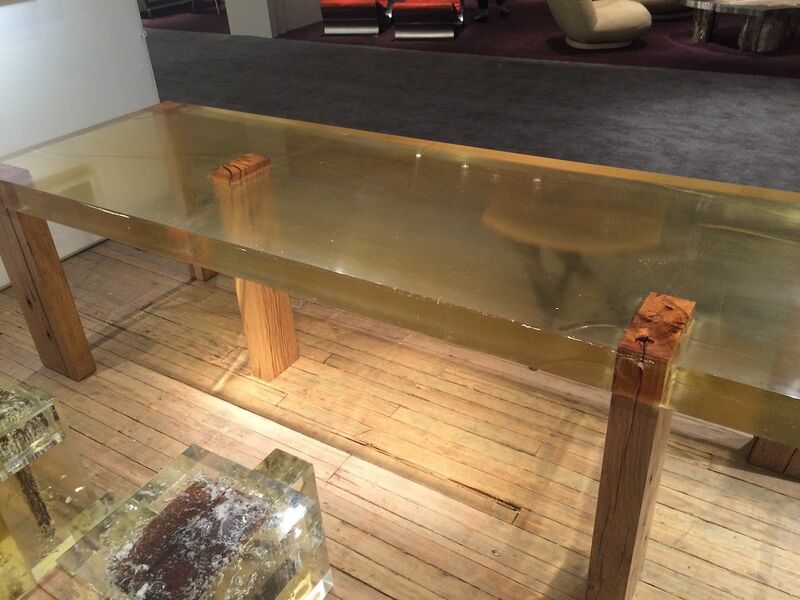 This amusing cocktail table is by Chinese-born designer Shi Jianmin. 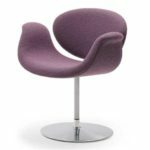 Swedish born Patrik Frederikson and British native Ian Stalled (are known for their avant-garde design objects, furniture, and interiors. 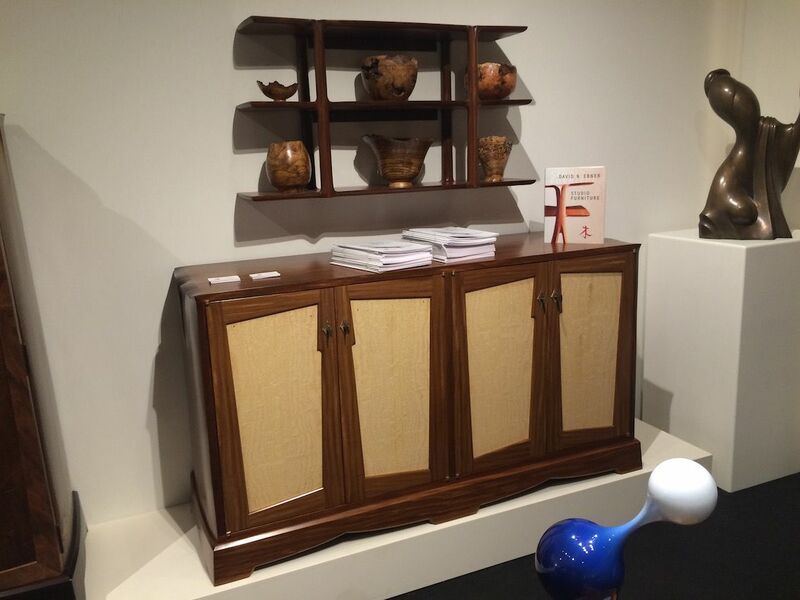 The David Gill Gallery showed pieces from UK designers such as Fredericton Stallard. 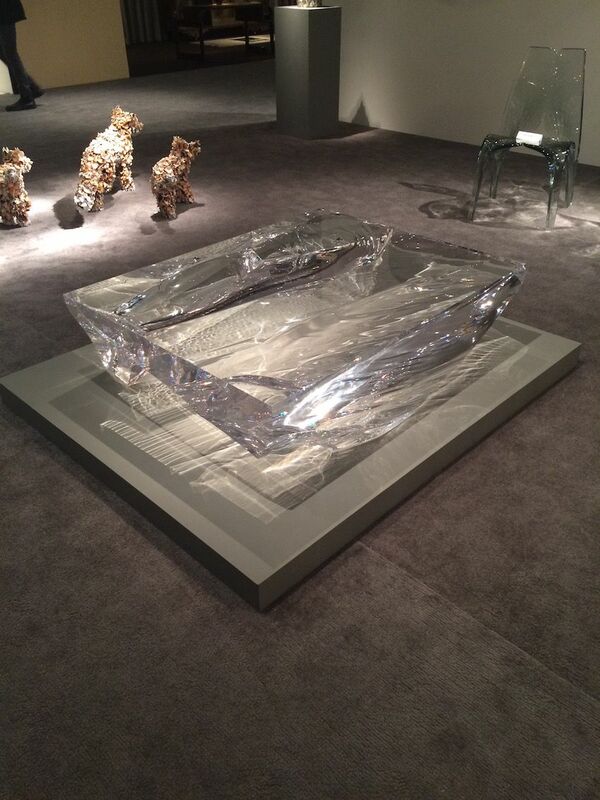 Made from acrylic, this “Gravity” coffee table seems to be a moment in time, like water stopped mid flow. One of the UK’s biggest architects is Dame Zaha Hadid. 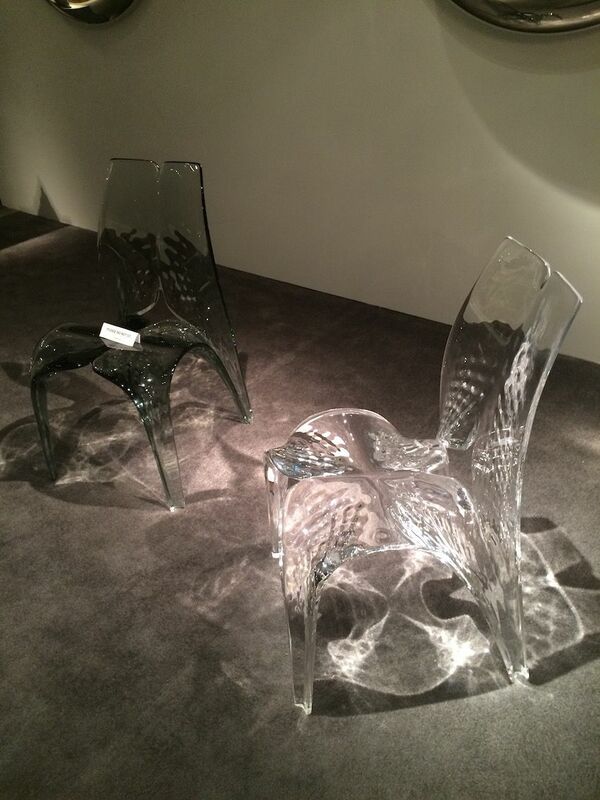 This “Liquid Glacial” chair is so ethereal it looks as though it might melt away. Sculpture ‘Fox Cub 2’, 2015 is made of Ceramic, stainless steel, and enameled wire. This mirror is created with the same concept, but each square is painted with a section of Hieronymus Bosch’s triptych Garden of Earthly Delights. The color variations are delicate and subtle, making the ceramic pieces look at a distance ike flowers. 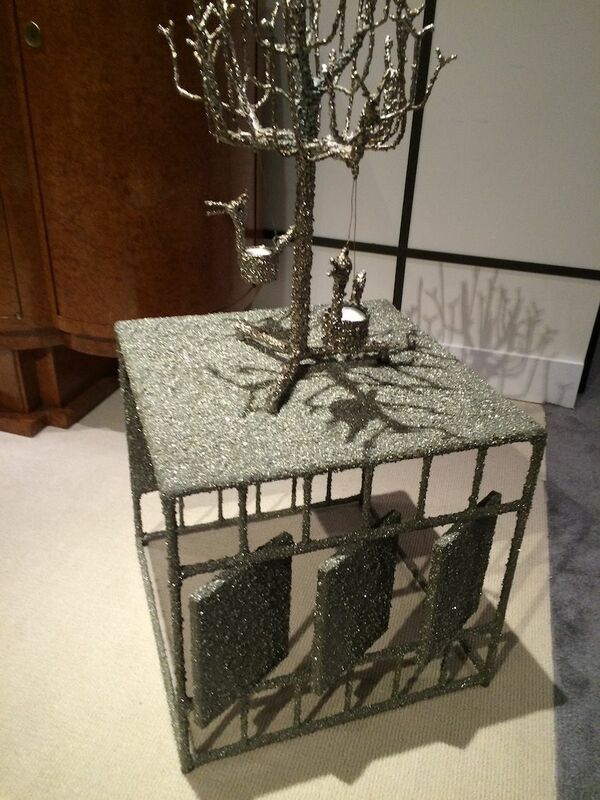 The Salon was not without its whimsical pieces as well. These animal sculptures by Barnaby Barford are an unusual take on several levels. The artist is know for using mass-market and antique porcelain figurines, and then altering them by removing and adding elements, and by repainting them. 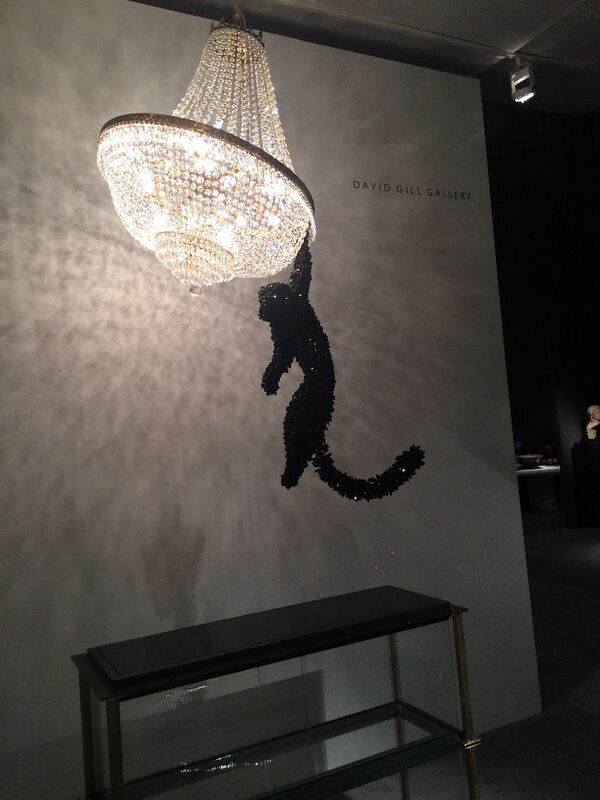 Barford’s jeweled monkey hangs from a large chandelier in this kitchsy lighting fixture. 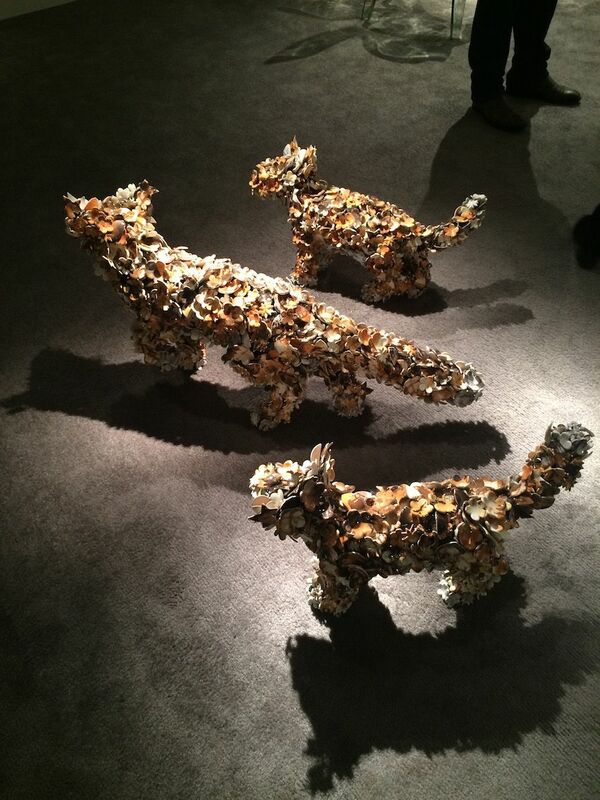 Some pieces we saw were gilded — either partially or entirely — in crushed stone. 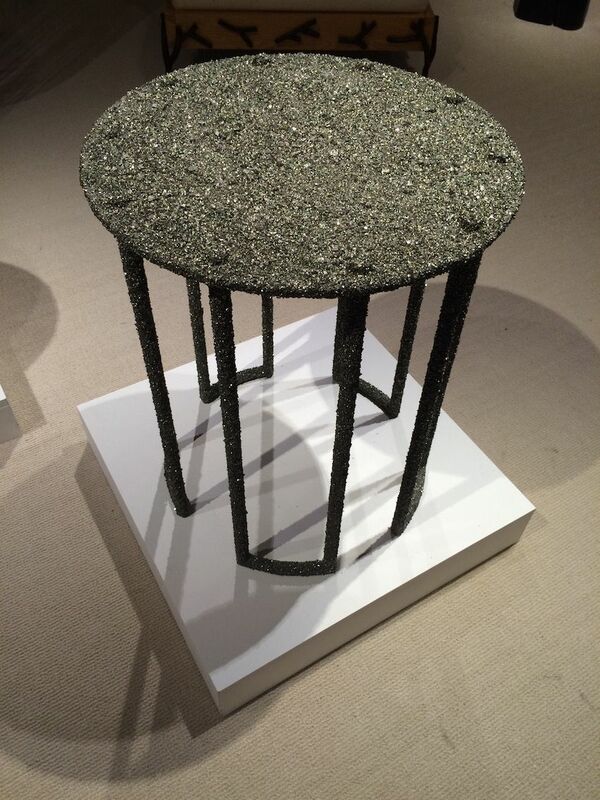 This occasional table is coated in crushed pyrite. 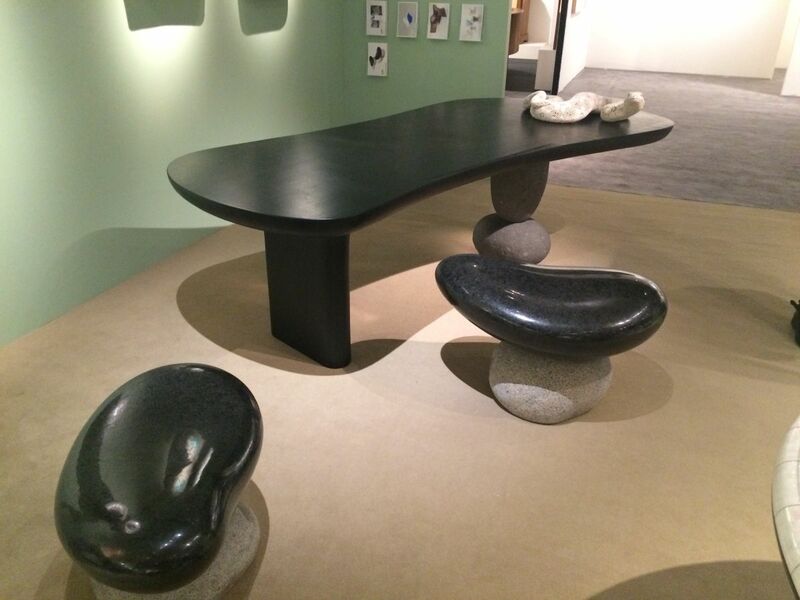 The DeLorenzo Gallery presented a range of works by the AMOIA studio, highlighting tables enhanced with crushed stone. 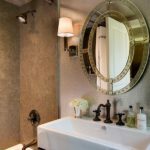 Crush pyrite adorns this small table as well, creating a glittering piece that would work in a casual or formal environment. 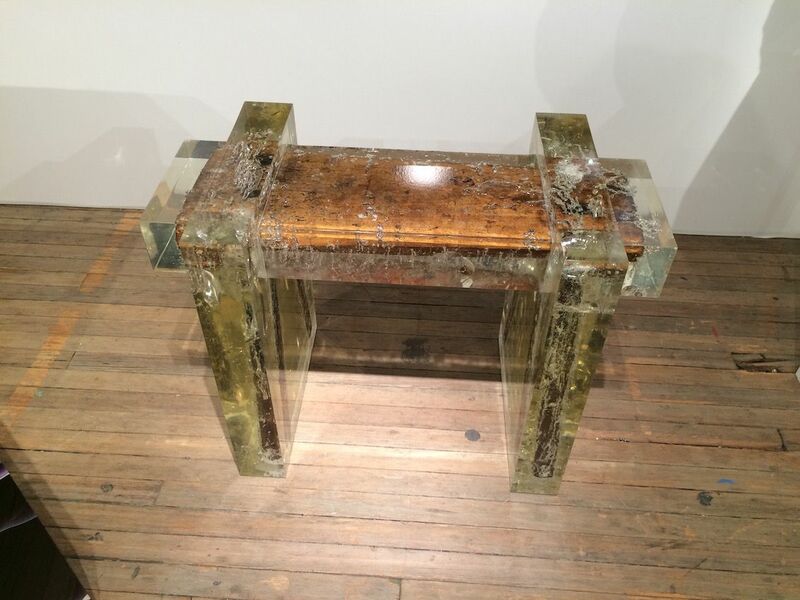 Cut larger than the crushed stone for the fully gilded pieces, the reflective surface it gives a humble table is no less attractive. 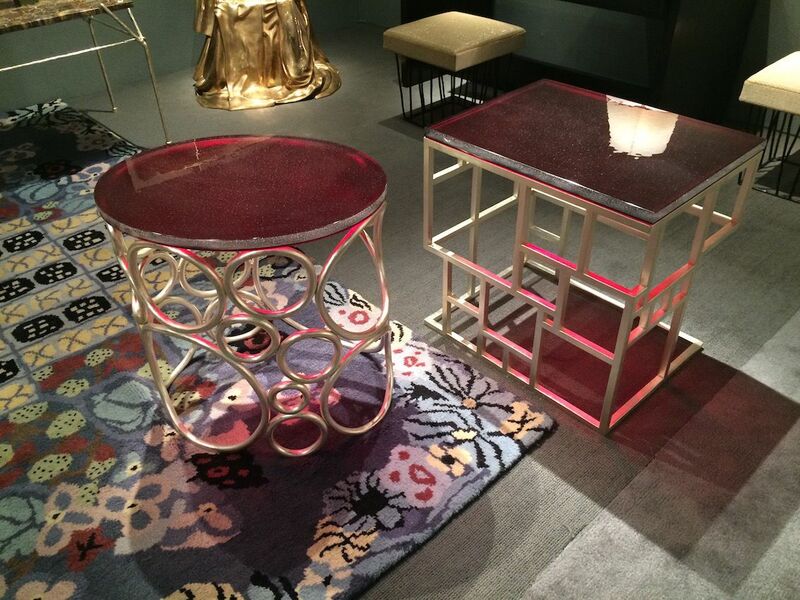 If total gilding is too much for your style, tables like these are “dipped” in crushed stone. Here is a close-up of the larger stone pieces. 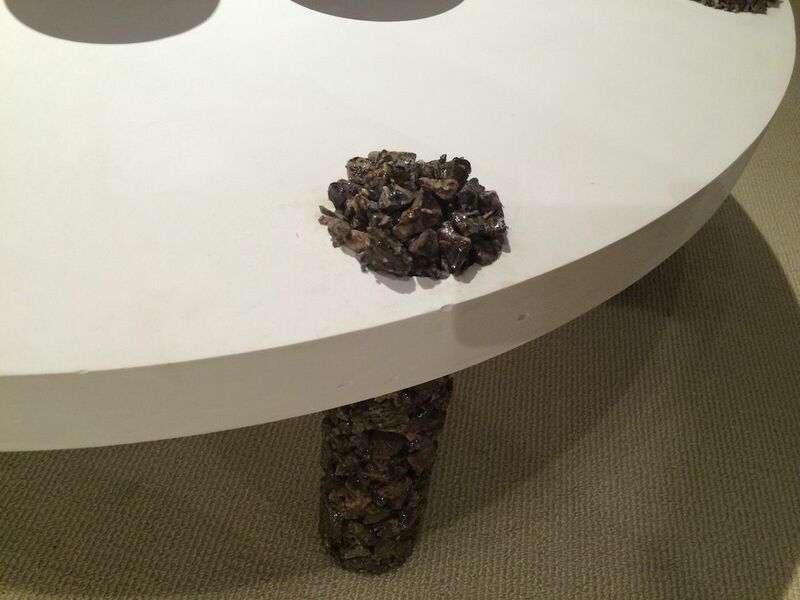 This coffee table features crushed stone on the legs, as well as on top, as a decorative element. A closer view of the stone use, which tourmaline and less sparkly. 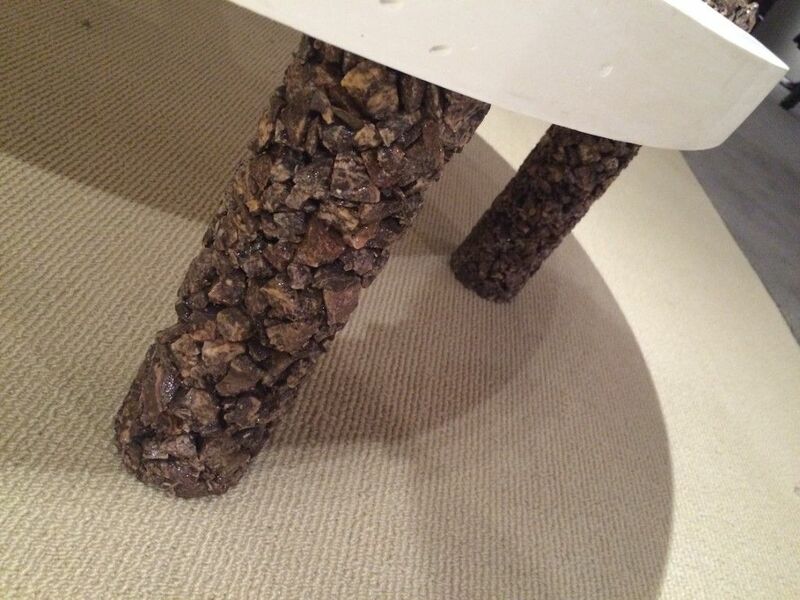 The stone coating give the coffee table legs added interest and heft. 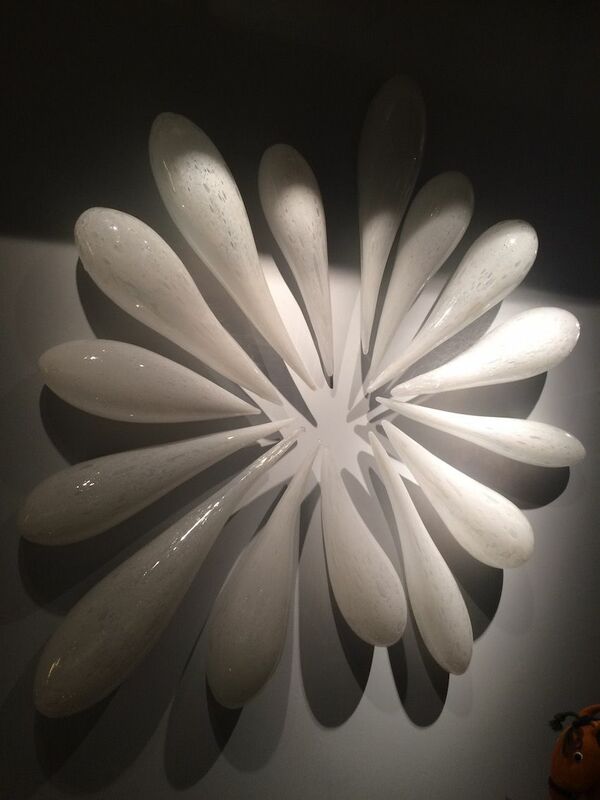 Jeff Zimmerman’s wall hung “Splash” sculpture is made of 17 pieces of hand-blown baking soda glass. Kentucky native and glass sculptor created this wall art piece, which drew you into the R & Company both from across the room. 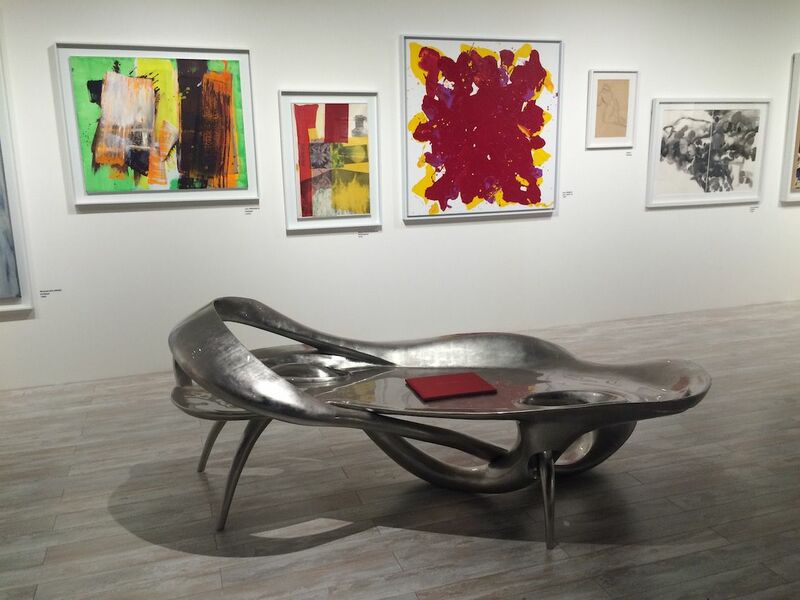 Whether you have modern decor, contemporary or more traditional, his “Splash” sculpture would be a focal point. A closer look reveals the bubbles in the glass, which add to the character and dimension of the piece. 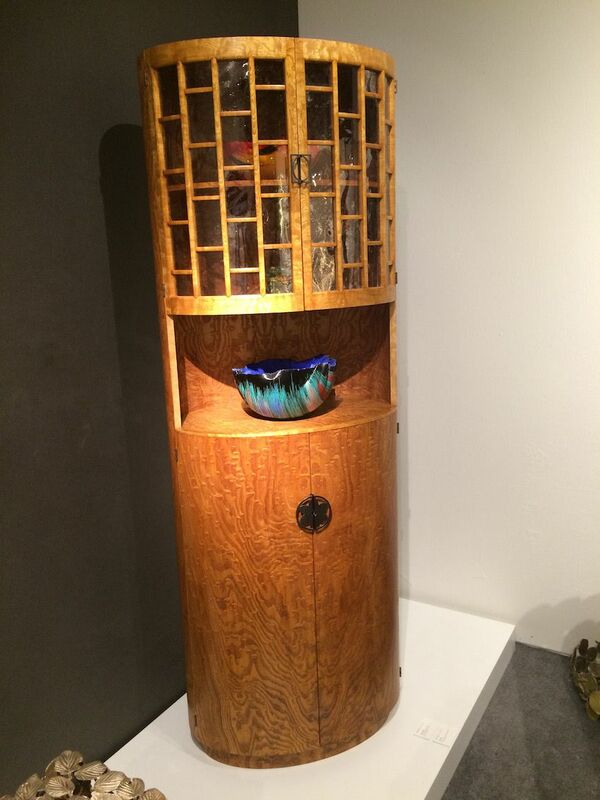 Wolfe’s work, represented at The Salon by R & Company, uses glass casting and blowing to create his unusual forms. 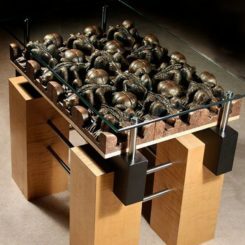 U.S. artist Thaddeus Wolf uses non-traditional glass techniques to create his works. 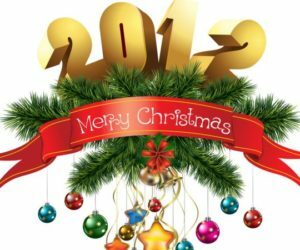 He often uses a glass molding process where each mold can only be used once. He later colored glass and then carves into it to reveal the different hues. Nikolai and Simon Haas started as stone carvers and are now known for a variety of original furniture designs and objects. 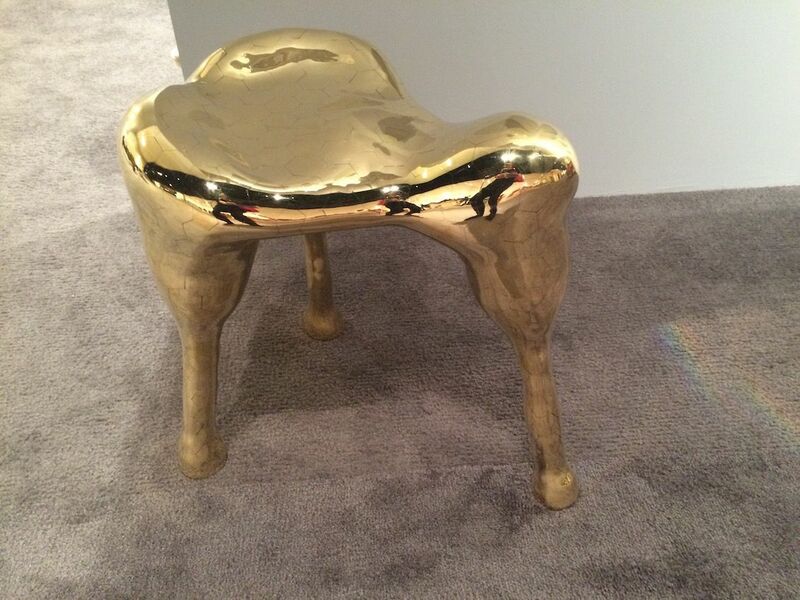 This is their Unique Hex stool, rendered in brass. Swiss born Christian Wasserman creates these modern yet somehow homey designs. We could easily see his “Dodecahedron” chandelier hanging over the family dining table. 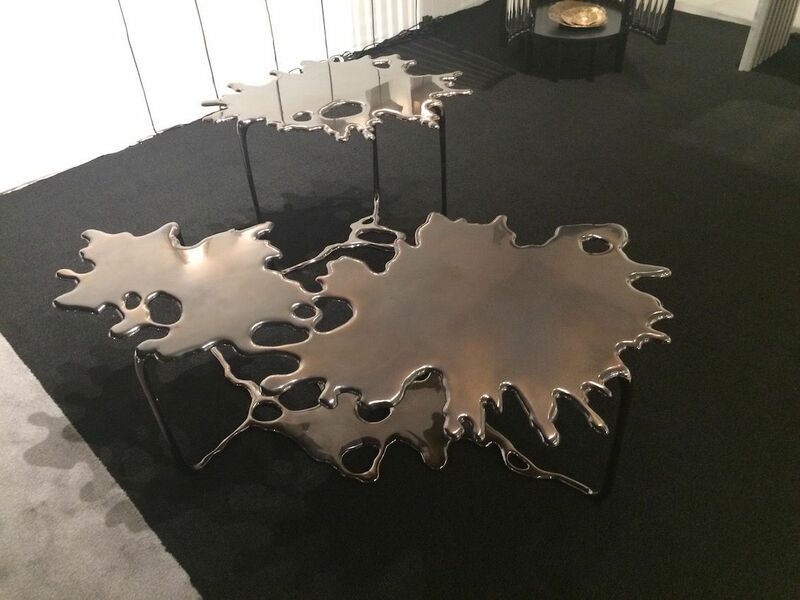 Created in bronze, this coffee table would be the focal point in any interior design. Even in smaller renditions, the Puddle series is still dramatic. 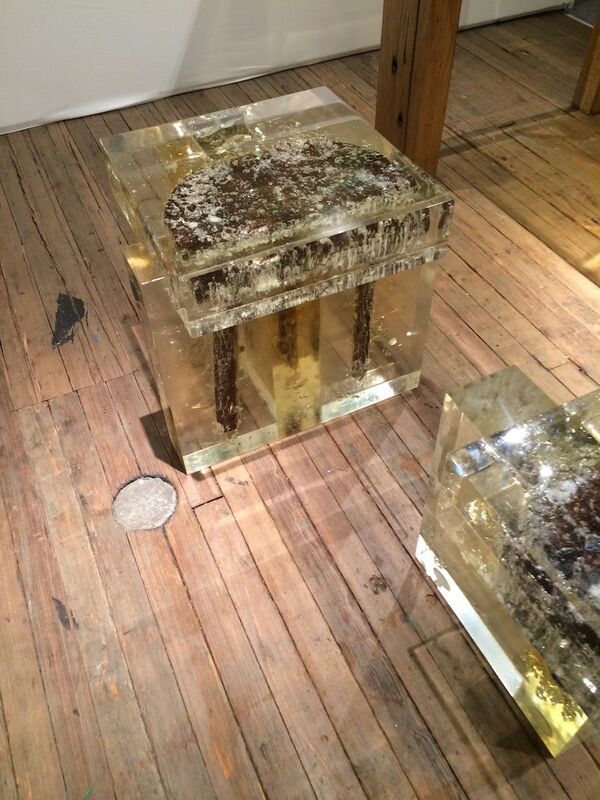 Wow is all we can say to Stefan Bishop’s “Puddle” coffee table presented by the Cristina Grajales Gallery. 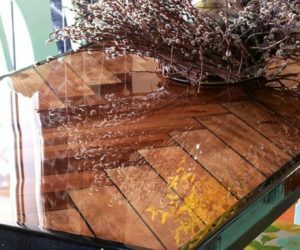 The light that filters through the colored glass tops of these tables makes parts of the metal base below glow with red light. Beautiful indeed. The myriad colors in this piece are all basically neutral, lending it to endless possibilities. 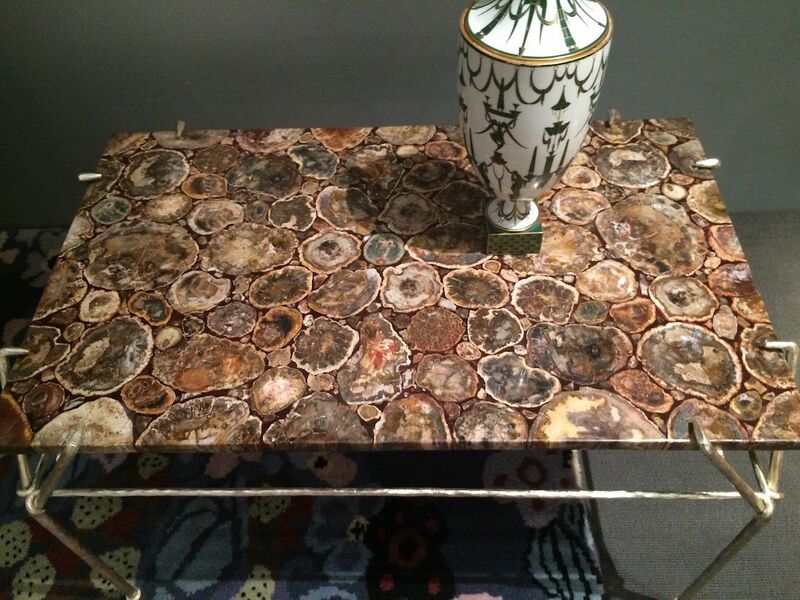 Petrified wood makes for a stunning table top. Marina Karella’s “The Gold Cloth” is a gorgeous piece of art. 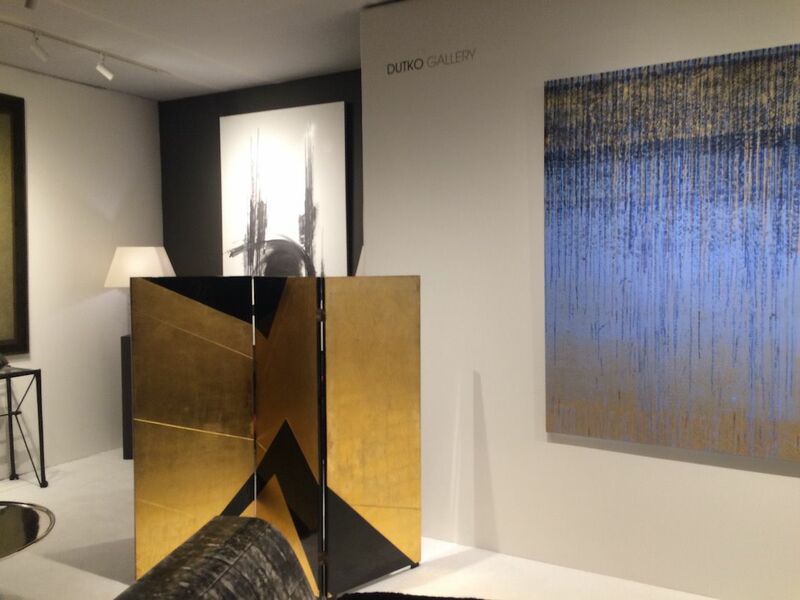 The gold screen shown here would be a an elegant element in any room. 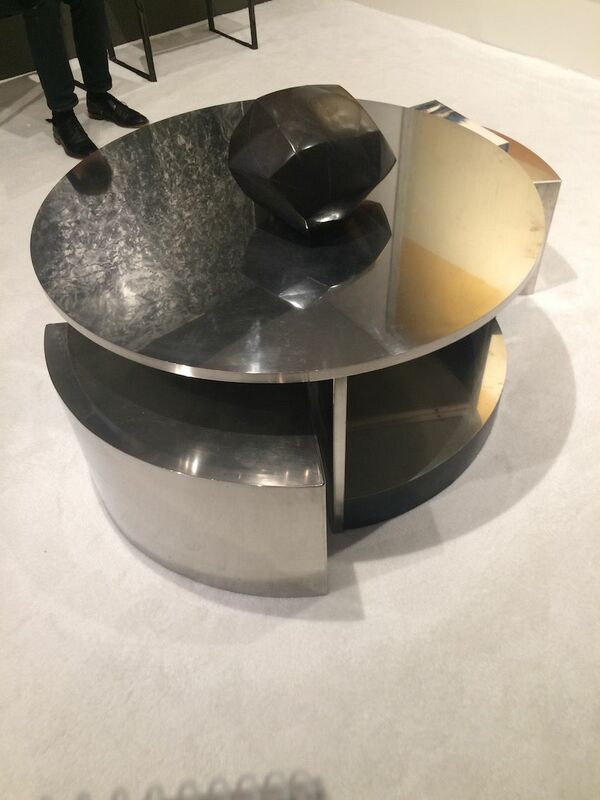 Pergay’s “Two-Seat Tambour Table” was created in 1968 of Stainless steel. 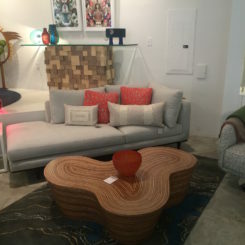 The Dutko gallery showed some beautiful art as well as stunning furnishings, such as this coffee table by Maria Pergay. 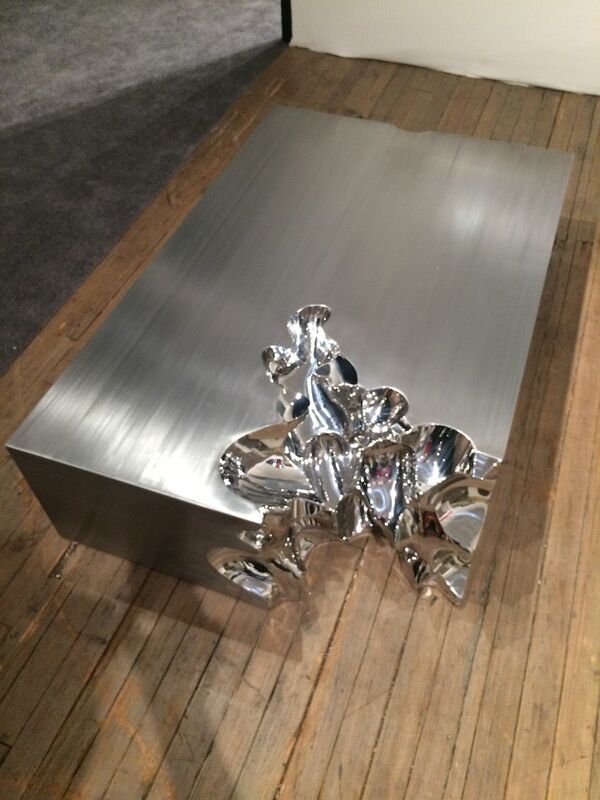 The Romanian-born artist based in Paris, is known for her innovative use of stainless steel. The lounge by Katsu Hammanaka is the perfect piece to pair with a larger piece of wall art. The texture of the frame is stunning. The clever angles of this cabinet presented by the Modern Gallery make it fun while being a substantial piece of furniture. 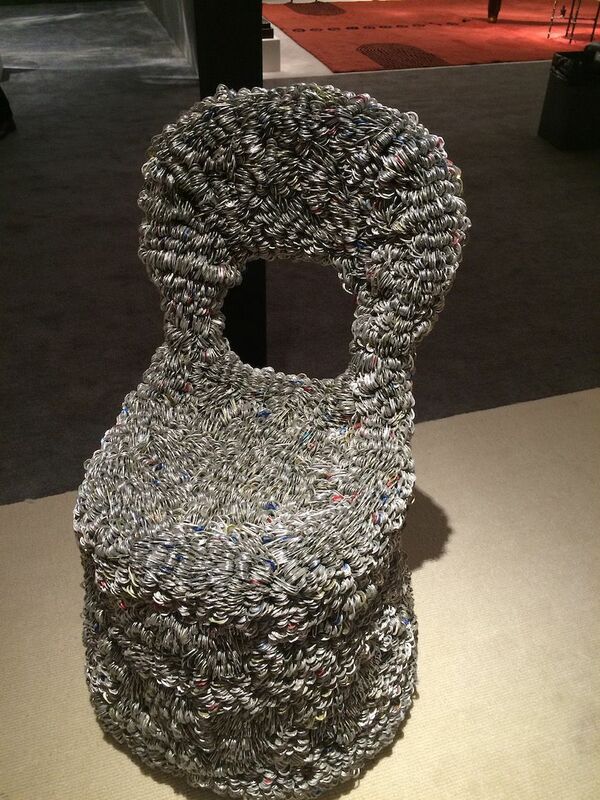 Clare Graham’s Pop Top side chair, from 2000 is an attention getter. Not just a whimsical piece, it is functional seating. 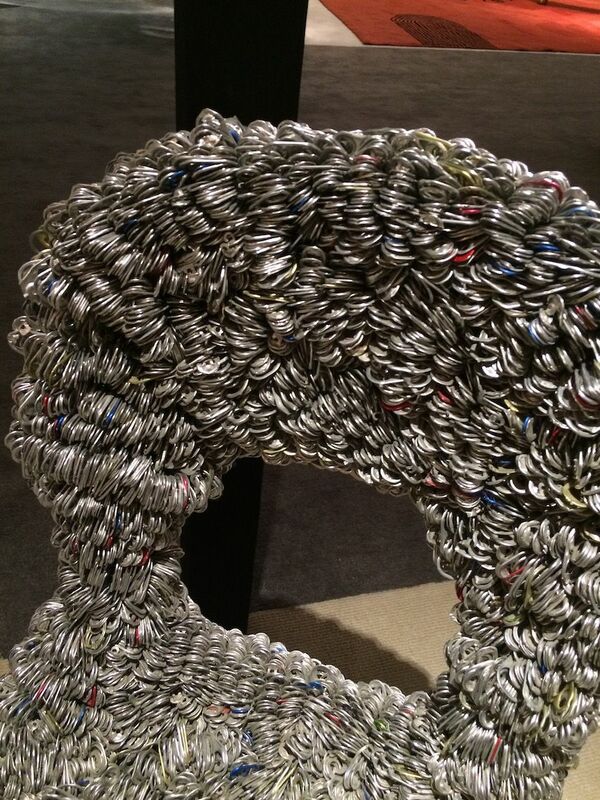 A closer view of the pop tabs that make up the chair. 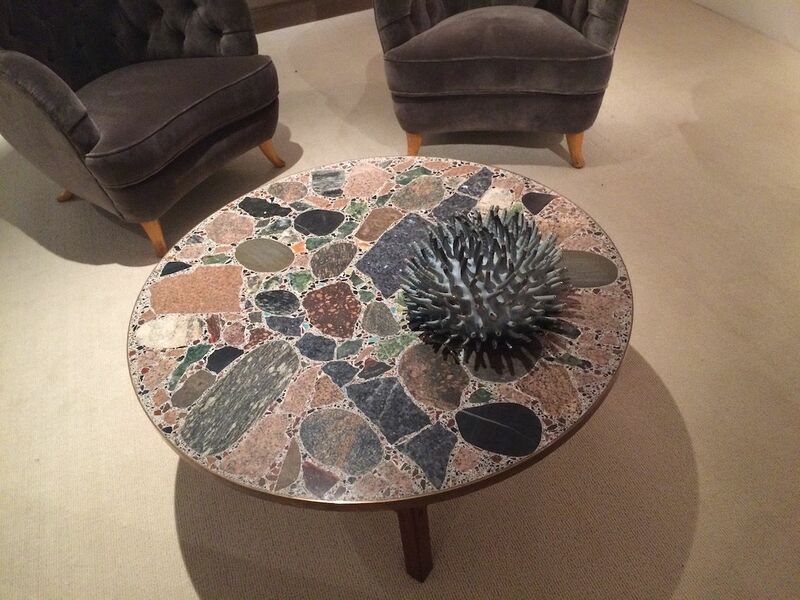 A remarkable stone table is right for any living space. 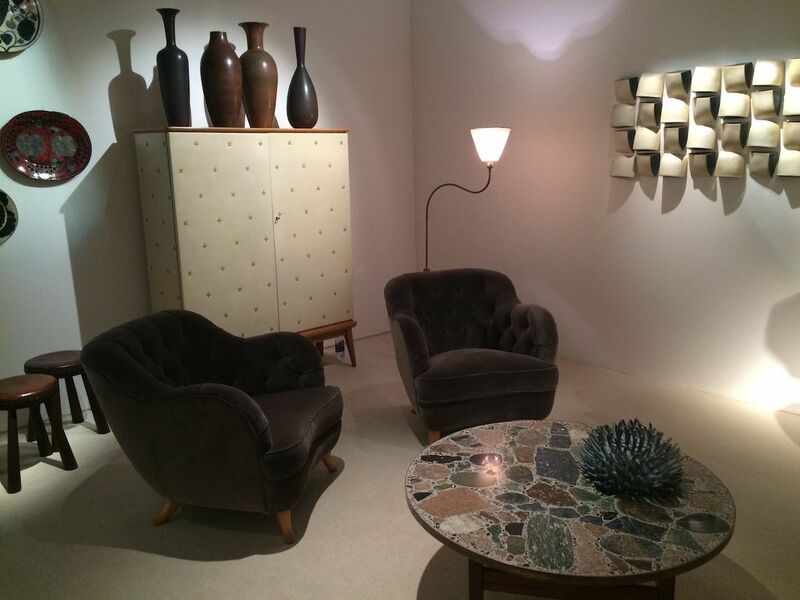 A wide variety of antique pieces were presented by Modernity, which specializes in the collection and sale of rare and high-grade furniture, ceramics, glass, lighting and jewellery by important Scandinavian designers. This grouping from Modernity shows a range of pieces: The table by Torbjorn Agdal, among the most prolific post-war Norwegian designers, now among its most famous, chairs by Swedish designer Elias Svedberg, and the armoire by German maker Otto Schulz. 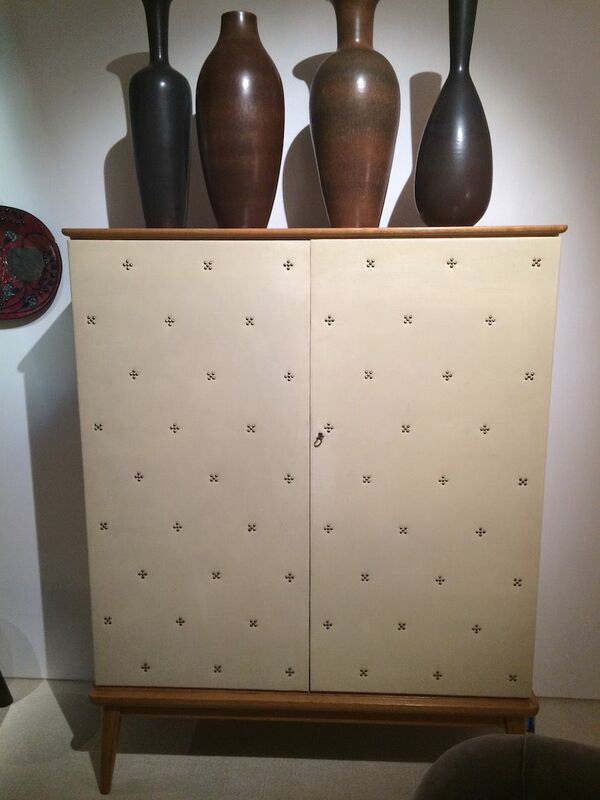 The armoire is covered in vinyl, which in the 1940s was called art leather. 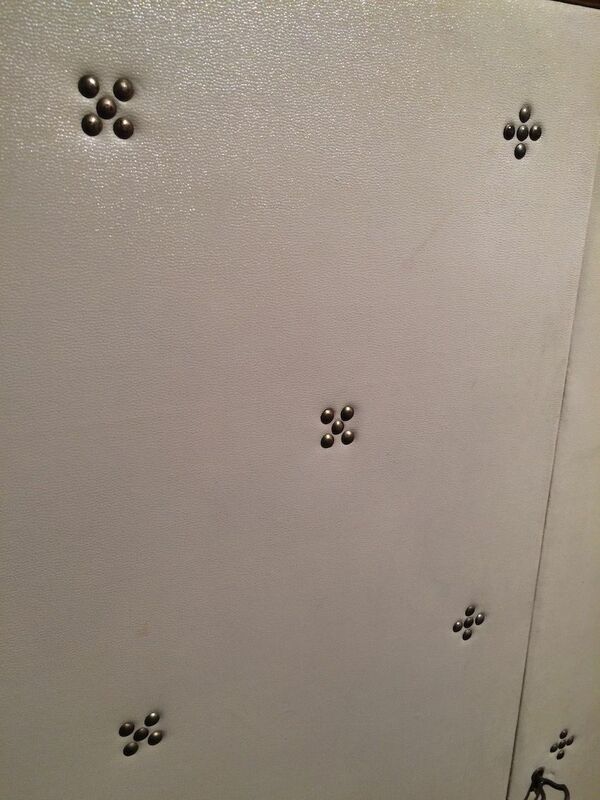 Here’s a closer look at the nailhead detail, which is a very distinctive feature of the piece. 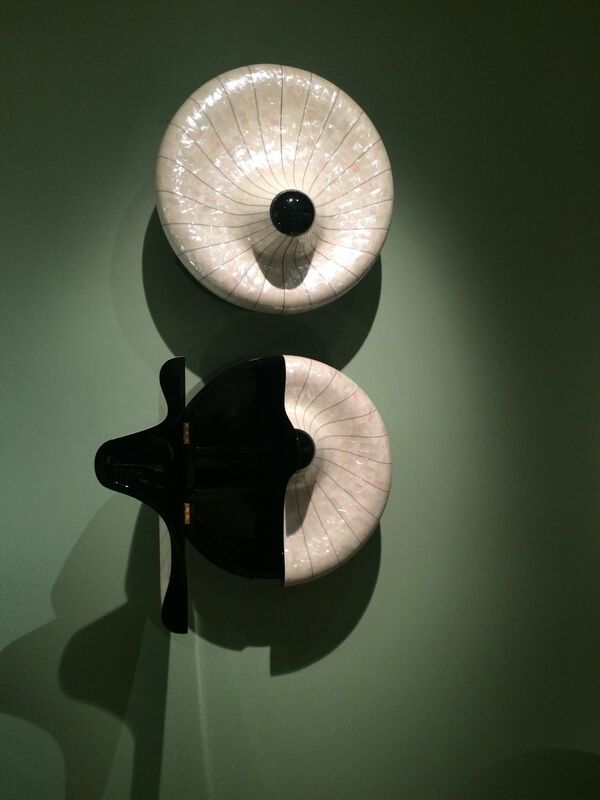 Galerie Chastel-Maréchal’s display included these stunning mirrors by renowned French artist, jeweler, and designer Line Vautrin. ’The artist’s jewels and sculpted objects defined Parisian Neo-Romantic chic. Fibonacci, 2015, by Sebastian Brajkovic garnered a lot of attention in pre-show stories and Salon reviews. 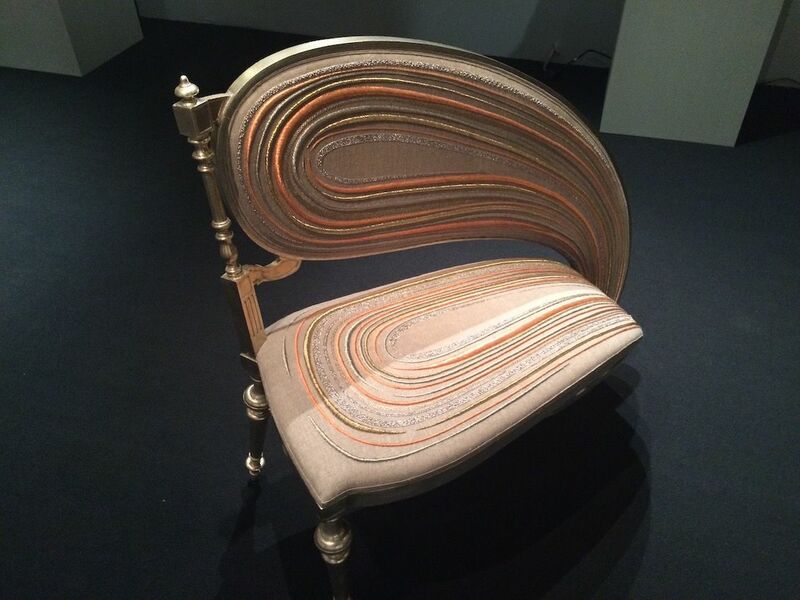 It is patinated bronze, silk embroidered upolstery by Jean-Francois Lesage, presented by the Carpenters Workshop Gallery. 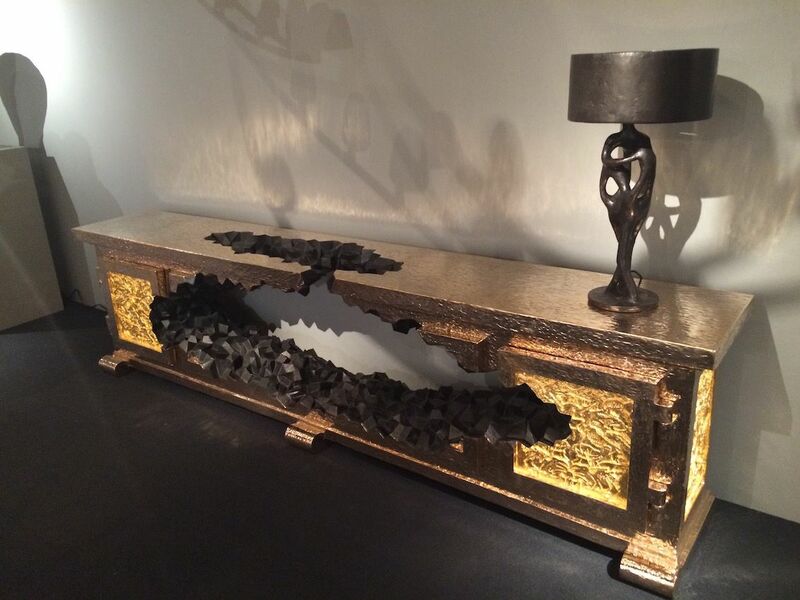 Limited Edition Robber Baron Buffet, 2013, is made of polished and patinated bronze, with 24K gilding. Carpenter’s Workshop Gallery was showing some amazing pieces, including this Robber Baron Buffet. 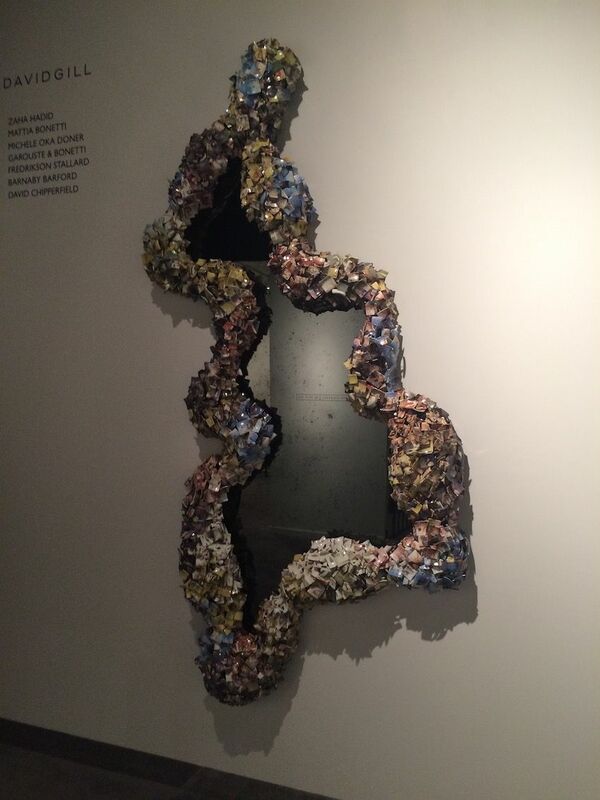 It is a “deconstructive, neobrutalist” piece, said the gallery representative. 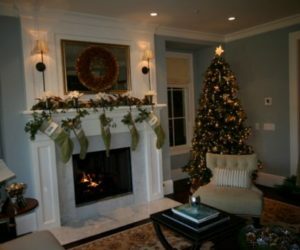 The center part which shows the coal is surrounded by the opulent gold doors that open to reveal shelving. The juxtaposition of the two is a political statement on wealth, she added. 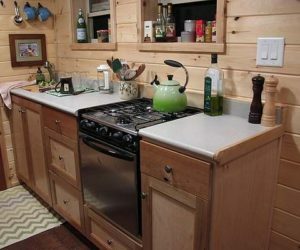 Have a big space? 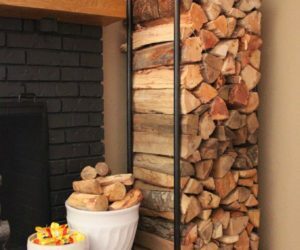 This spectacular wall piece might be for you. 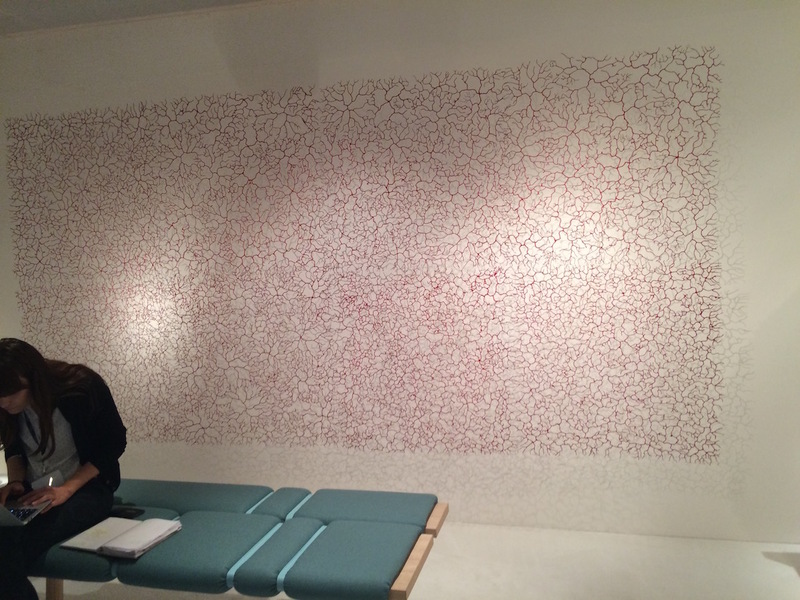 The lines of the piece, reflected on the wall, increase the complexity of the visual. Gjertrud Hals “Insula,” 2006, is made of metal threads and fibers. 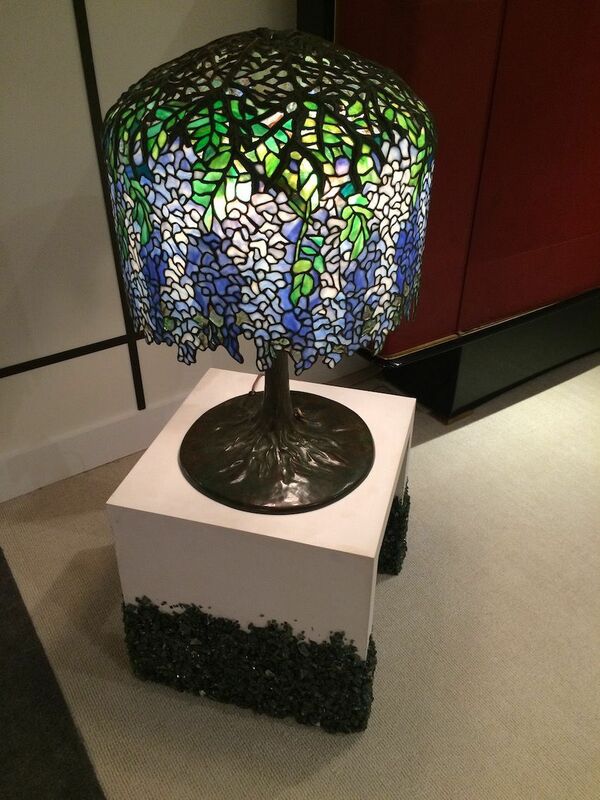 It was presented by the Galerie Maria Westergren of Paris. 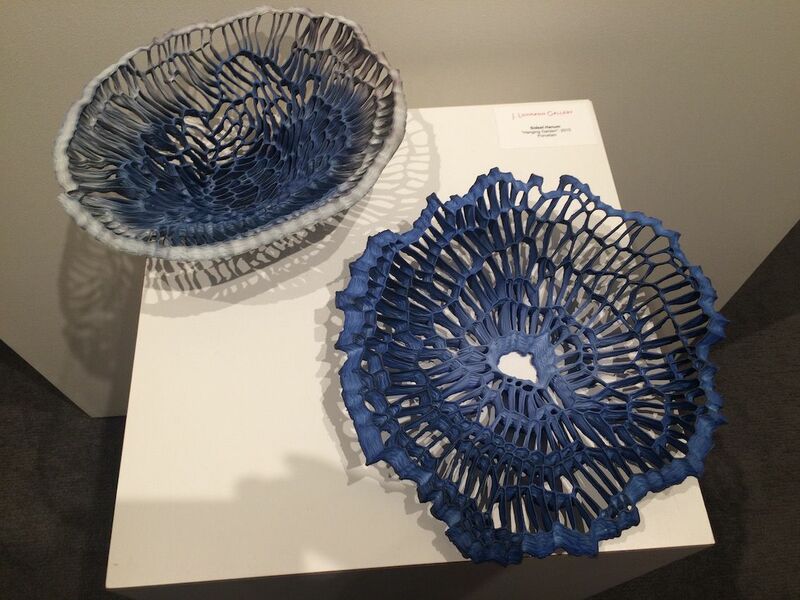 Artist Sidsel Hanum created these bowls, whose openwork is visually engaging. 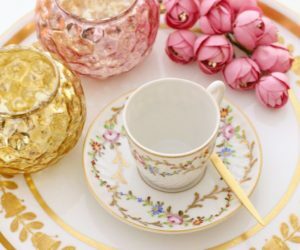 The The Lohmann Gallery booth had so many beautiful art accessories and vessels for the home that it was difficult to choose what to show you. 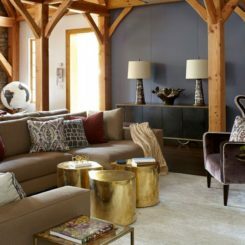 The pieces range from abstract and freeform to sleek, smooth and mesmerizing. 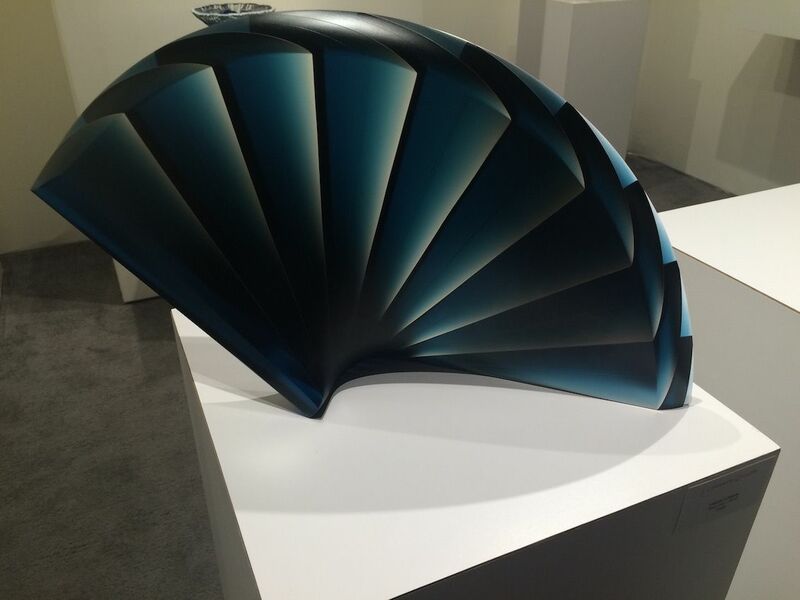 Lukacsi’s “Blue Fan”, 2015, was Winner of the Gold Prize at the International Exhibition of Glass Kanazawa, Japan in 2011. 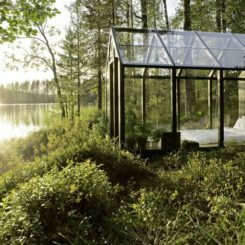 Glass artist Laszlo Lukacsi, laminated, ground, and polished reflective glass to make this stunner. 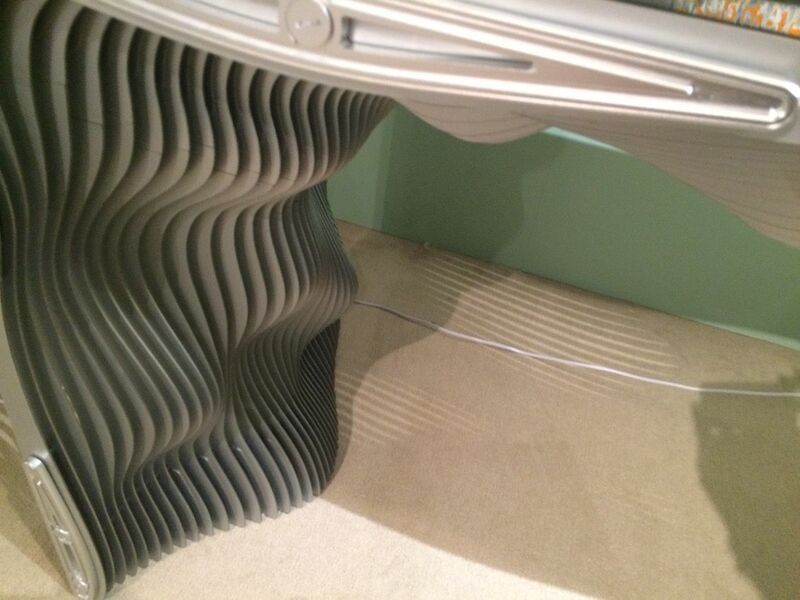 Viewed from different angles, the visual of the fan details changes and moves. 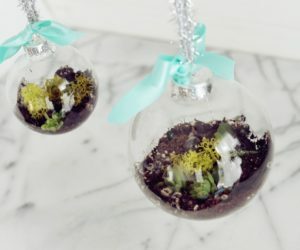 Talk about whimsy! 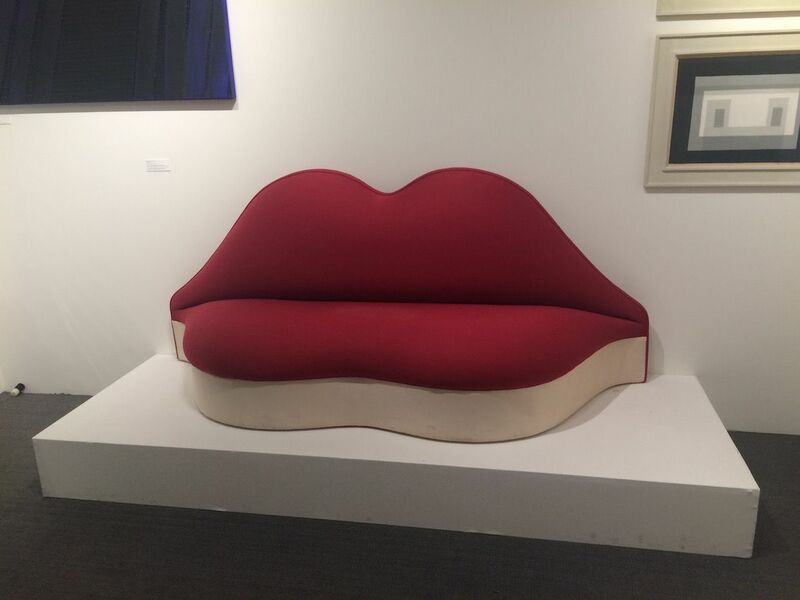 The Patrick Derom Gallery exhibit included this awesome sofa made to look like lips. 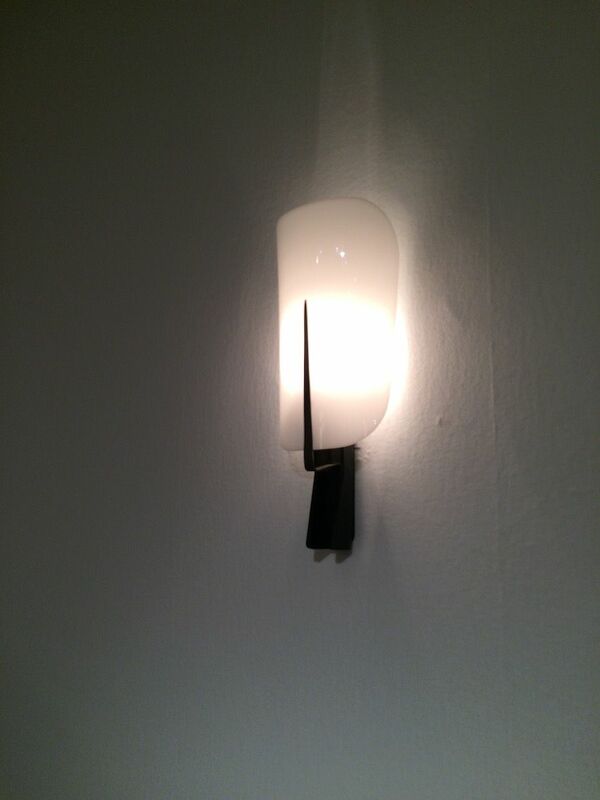 Jacques Biny’s wall sconce, 1950, is produced by Luminalite from black lacquered metal and brass, with a white perspex lampshade. Galerie Kreo, which has been open in Paris since 1999, focuses on producing new pieces in collaboration with the world’s most relevant contemporary designers. At The Salon they showed some modern lighting fixtures and some new furnishings. 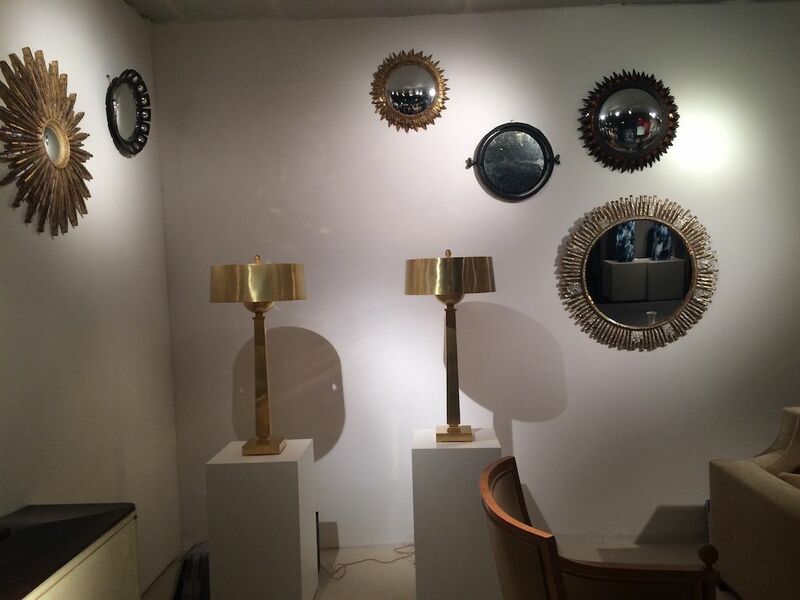 A variety of floor lamps illuminate one section of the display area. The unusual console, includes a pneumatic position for support and as a design element. Called “Shelf,” from the man machine collection (2014) of Konstantin Grcic , it is a limited edition of eight pieces. The “Game On” tables are Limited edition of 20 numbered and signed pieces, available in black lacquered ceramic or copper lacquer. 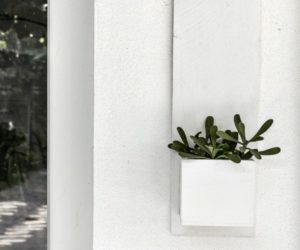 Modern home decor for the sports lover? You bet? 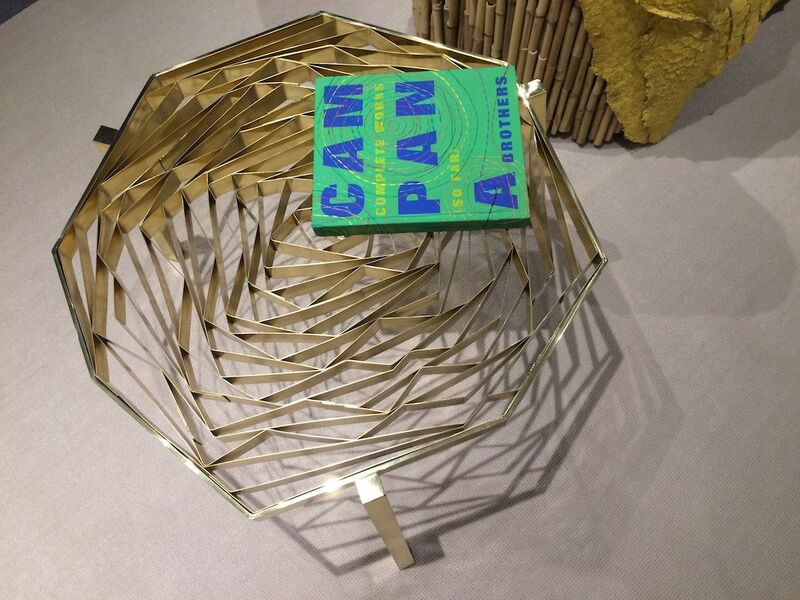 The “Game On Side Table” features the iconic lines of a basketball. 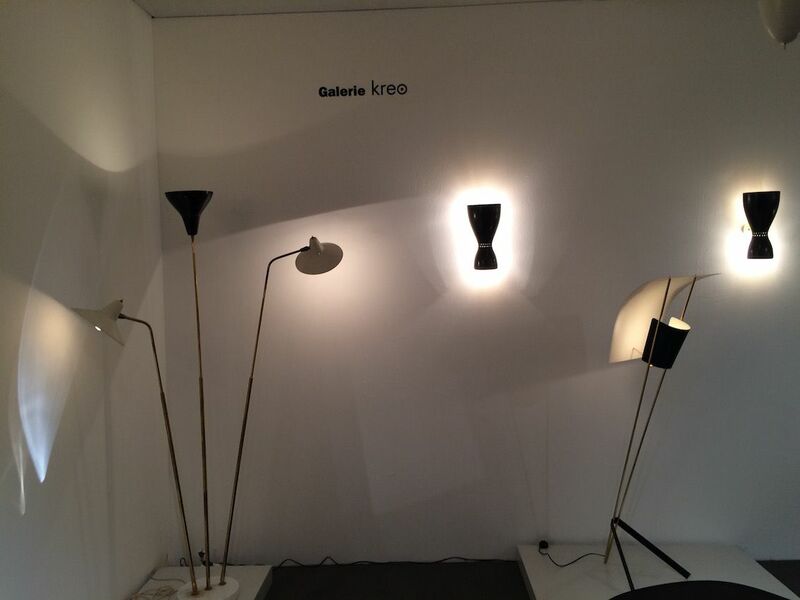 signed by Jaime Hayon, it is produced by Galerie kreo. 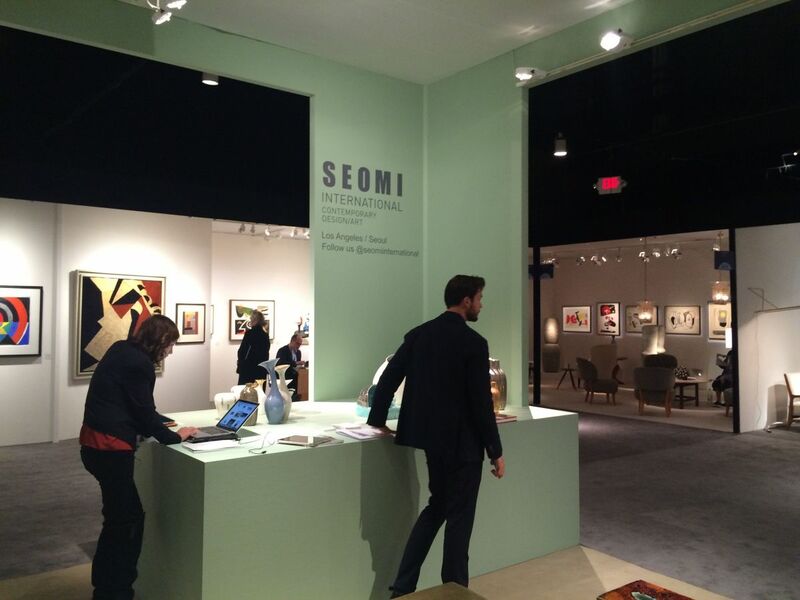 This year’s Salon exhibits offered many different options for just about every taste. 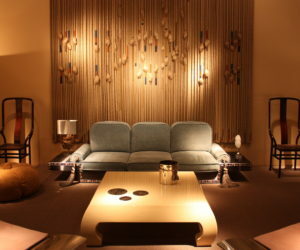 The art and furnishings were very livable, even if not necessarily affordable for most. 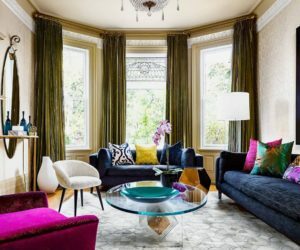 Regardless, viewing and studying high-end offerings like these can help refine your decor choices and offers a breeding ground for ideas.